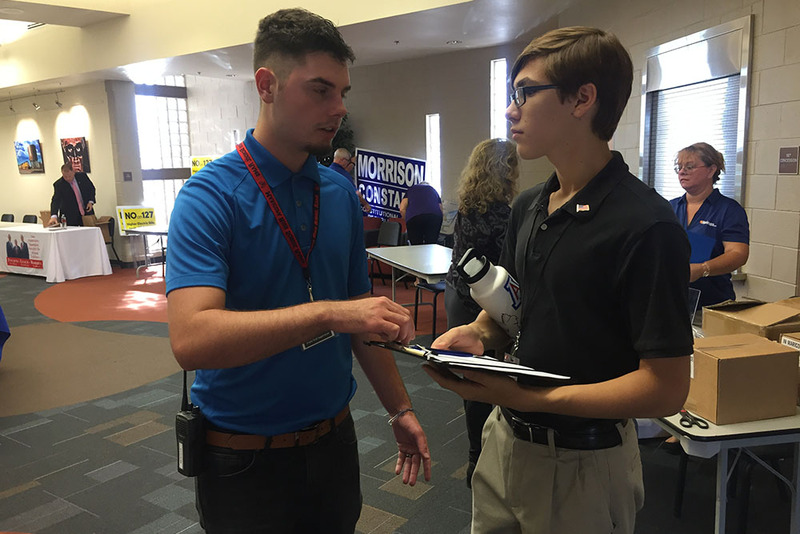 Home Tags Articles tagged with "Election"
Pinal County Elections Department estimates it has 20,000 early ballots and 6,800 provisional ballots left to count. Statewide there are an estimated 400,000 outstanding ballots. 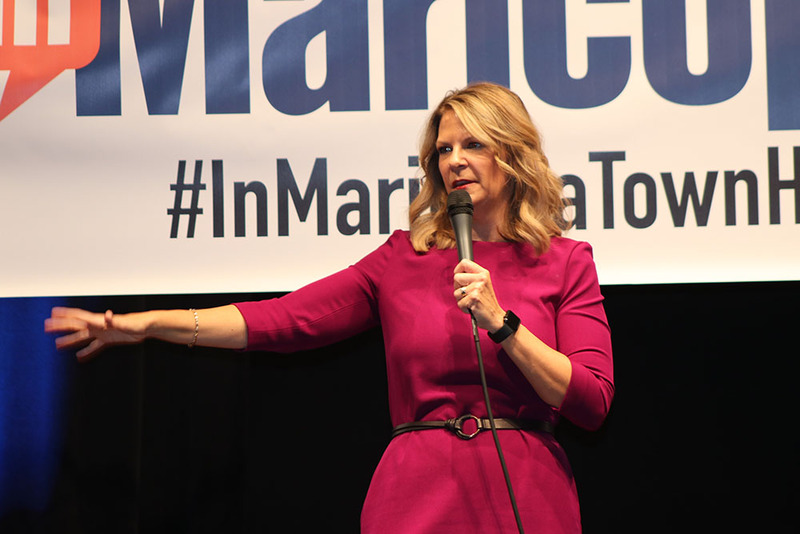 As the U.S. Senate race is thisclose, the methodical count and inconsistent policies on “curing” mail-in ballots have political party leadership on edge. The Republican Party in four counties sued Wednesday night and took particular aim at the recorders in Maricopa and Pima counties for allegedly not following a uniform standard by allowing voters extra days to fix or “cure” the ballots when signatures did not seem to match registration records. Friday, they reached a settlement that allows rural counties to “cure” their early ballots in the same way until Nov. 14. 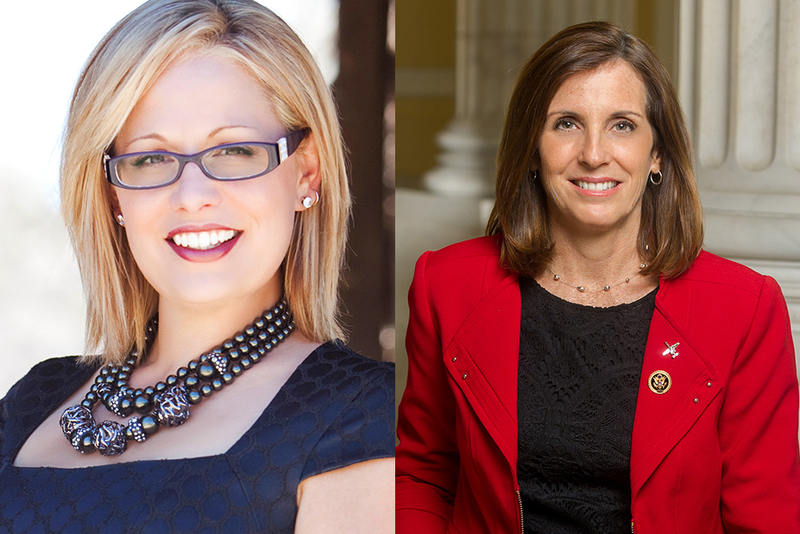 At issue is the battle for Jeff Flake’s senate seat between Democrat Kyrsten Sinema and Republican Martha McSally. 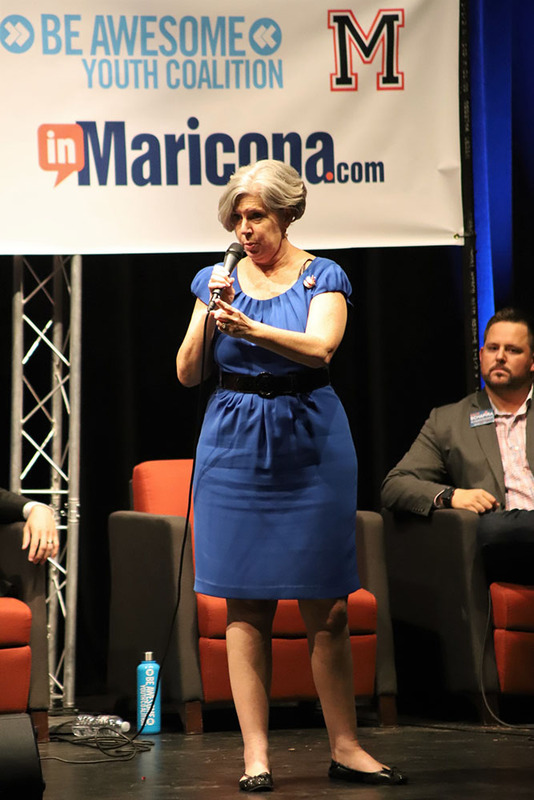 McSally had been slightly ahead of Sinema since early counts began to be announced Tuesday night until late Thursday afternoon. 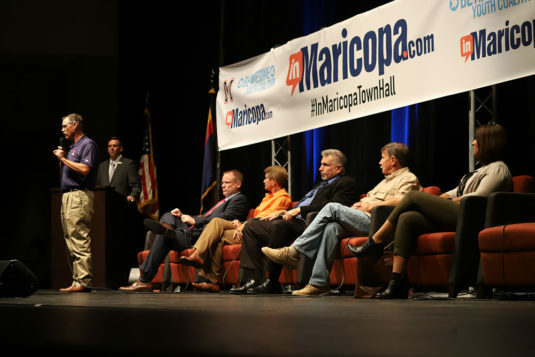 As of 3:45 p.m. Friday, Sinema had a 9,097-vote lead. The only other race that flipped in such a manner was for superintendent of public instruction. 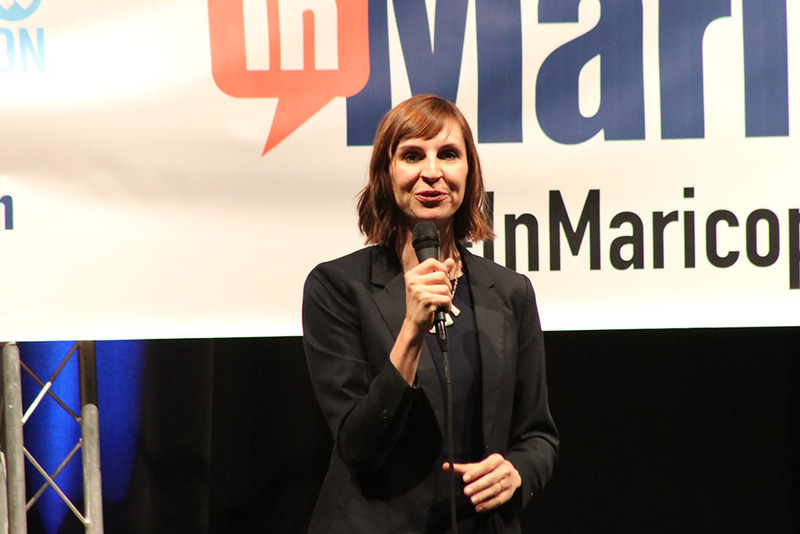 Democrat Kathy Hoffman had trailed Republican Frank Riggs in the early count but overtook him Thursday and now leads by more than 20,000 votes. Meanwhile Democrat Sandra Kennedy quietly has edged closer to Republican Rodney Glassman in the election for Corporation Commissioner. There are two seats available. 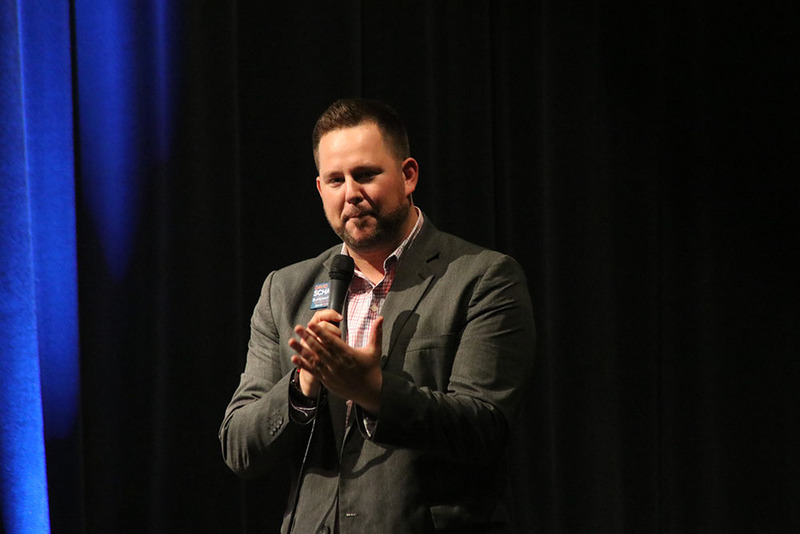 Though Republican Justin Olson is the top vote-getter so far, the top three candidates are separated by less than a percentage point. 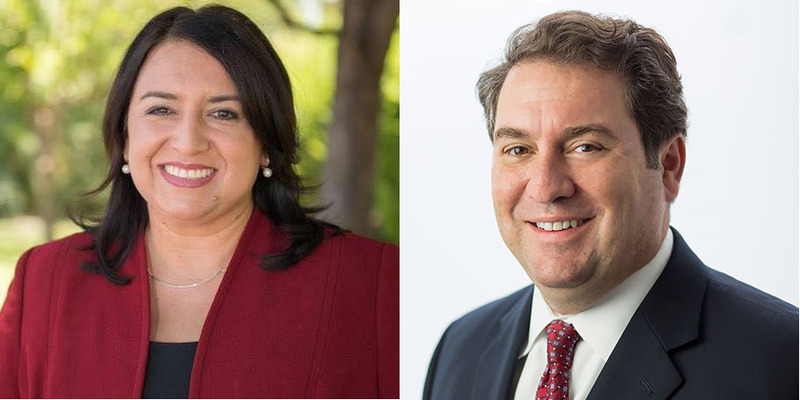 Kennedy is behind Glassman by 6,733 votes. 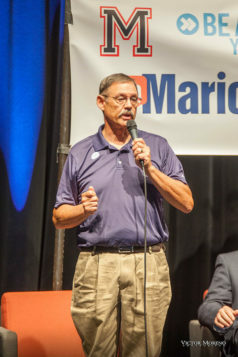 With just 15 percent of precincts reporting statewide, state Rep. Vince Leach has a sizeable lead in his first attempt at the state Senate in District 11. He leads Democrat Ralph Atchue by more than 5,000 votes. District 11 is in parts of Pinal and Pima counties. 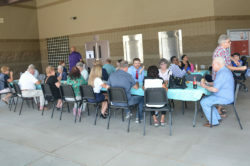 Only 11 percent of Pinal precincts have reported and only early ballots have been counted for Pima. 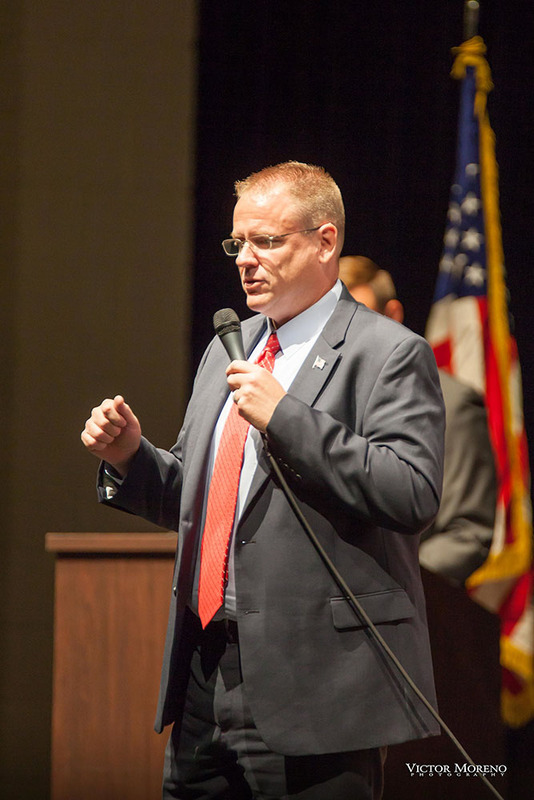 That being said, Republicans have opened a gap over Democrats in the District 11 House race. 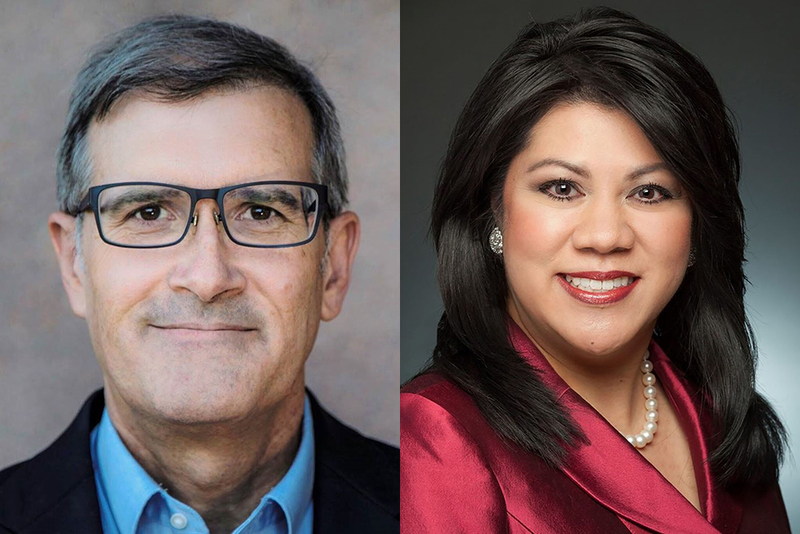 Incumbent Mark Finchem and Constable Bret Roberts both have more than 27,000 votes while Democrats Hollace Lyon and Marcela Quiroz trail with 22,500 and 21,300, respectively. Also in early results, the District 4 constable race is leaning heavily Republican in the bid to replace Roberts, with Glenn Morrison outpacing Democrat Andre LaFond 58 percent to 42 percent. 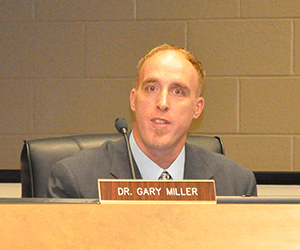 Other local and county races were noncompetitive. Republican Lyle Riggs remains justice of the peace with no competition. 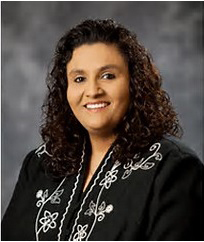 Republican Amanda Stanford also had a walkover for re-election as clerk of the Superior Court for Pinal County. What does a constable do and why is it an elected office? Republican Glenn Morrison and Democrat Andre LaFond, candidates for constable in the Maricopa/Stanfield (soon to be Western Pinal) Justice Court, explain during the InMaricopa.com General Election Town Hall. 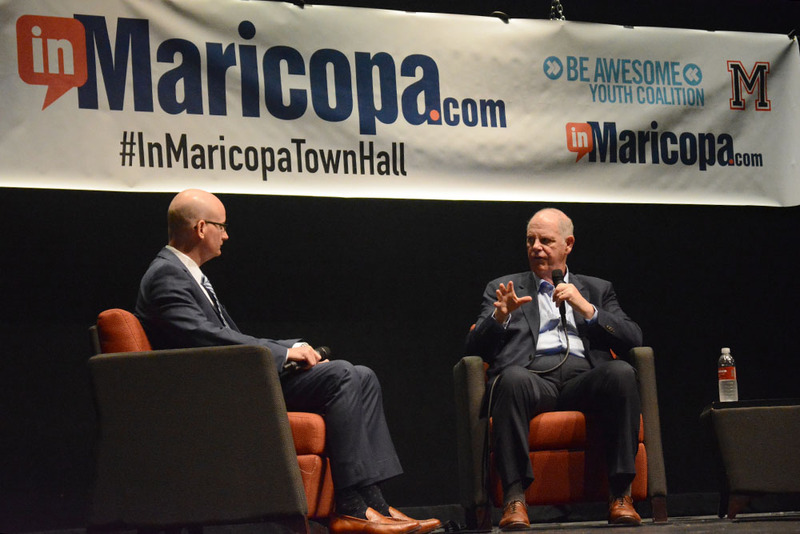 Congressman Tom O’Halleran, a Democrat running to keep his seat in the U.S. House of Representatives, answered questions on health care, gun safety, border security, infrastructure and more during the InMaricopa General Election Town Hall Oct. 6 at Maricopa High School Performing Arts Center. 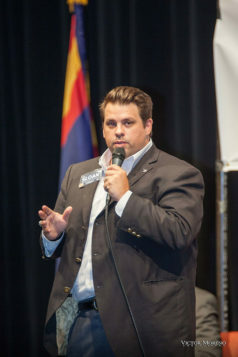 His Republican opponent, Wendy Rogers, was not available. How do you like your judges? At the end of the General Election ballot, voters are asked whether to retain some current Superior Court, Court of Appeals and Supreme Court judges. The Judicial Performance Commission, getting feedback from attorneys, jurors, litigants and witnesses through surveys, found the four Pinal County Superior Court judges on the ballot meet the standards. Judges Delia Neal, Daniel Washburn and Kevin White each received 27 votes of “meets judicial standards” and none against. Judge Steven Fuller received 19 votes of “meets judicial standards” and four votes of “does not meet judicial standards.” Six members of the commission did not vote on Fuller. 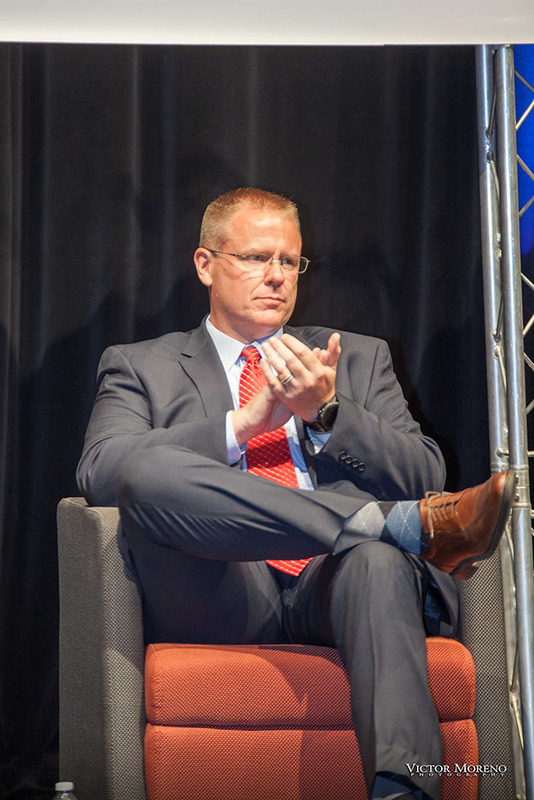 He was the only judge up for affirmation in the state to receive more than one vote of “does not meet judicial standards.” However, his overall average score was still a high 97.75 percent. 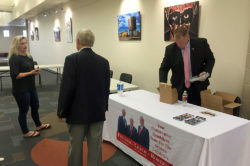 Fuller and Neal received their lowest marks among attorneys in “judicial temperament,” with Neal scoring 91 percent and Fuller scoring 85 percent. On the other hand, Washburn scored 100 percent in judicial temperament, and White 99 percent. 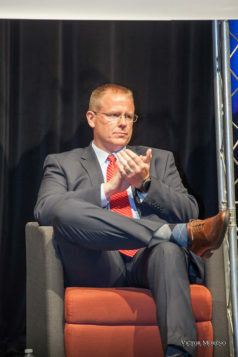 Washburn’s lowest marks came from attorneys rating his communications skills at 92 percent. White’s lowest score came from litigants/witnesses rating his integrity at 93 percent. His lowest mark among attorneys was also in integrity (96 percent). 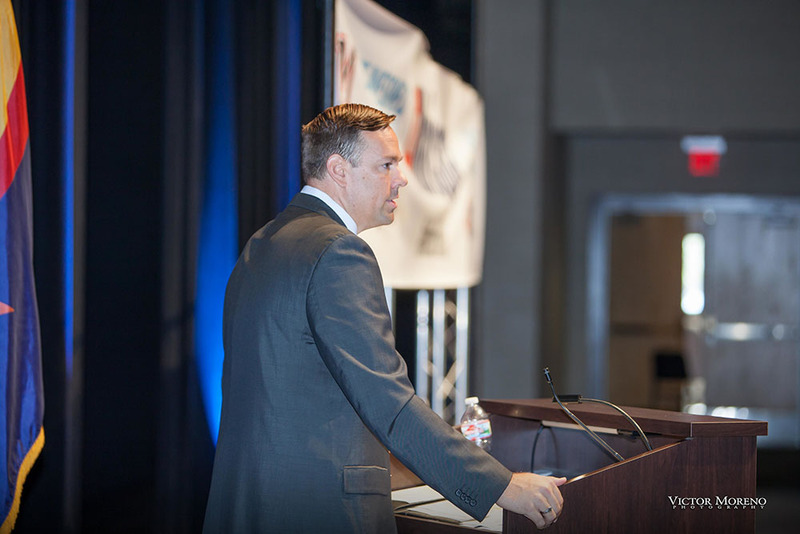 Washburn and Neal scored 100 percent across all categories with litigants and witnesses. 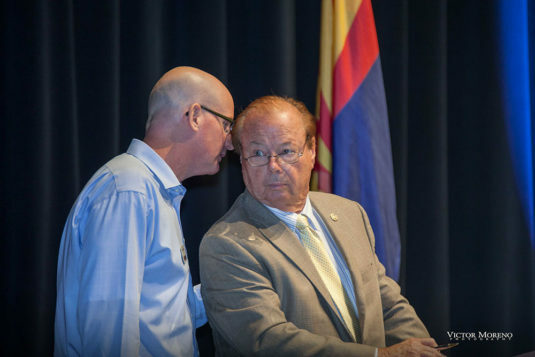 Arizona Supreme Court judges Clint Bolick and John Pelander III are also on the ballot for retention, and both received 27 votes of “meets the standards” and no votes of “does not meet standards.” Bolick had an average score of 94 percent. His lowest score was in judicial temperament at 83 percent. Pelander’s average score was 99.6. His lowest score was a 98 in communication skills. 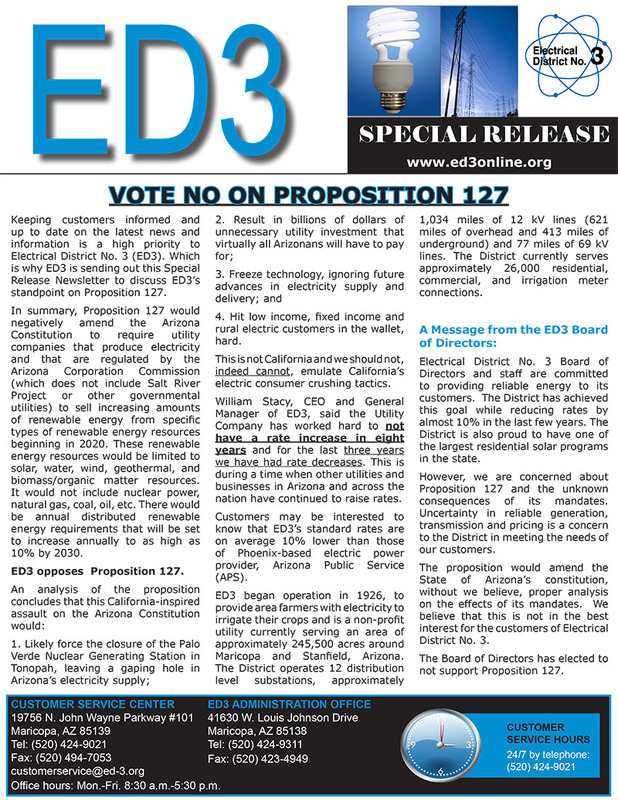 This information appears in the October issue of InMaricopa. 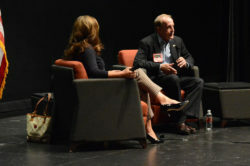 Facilitator AnnaMarie Knorr (left) chats with State House candidates Hollace Lyon and Bret Roberts. 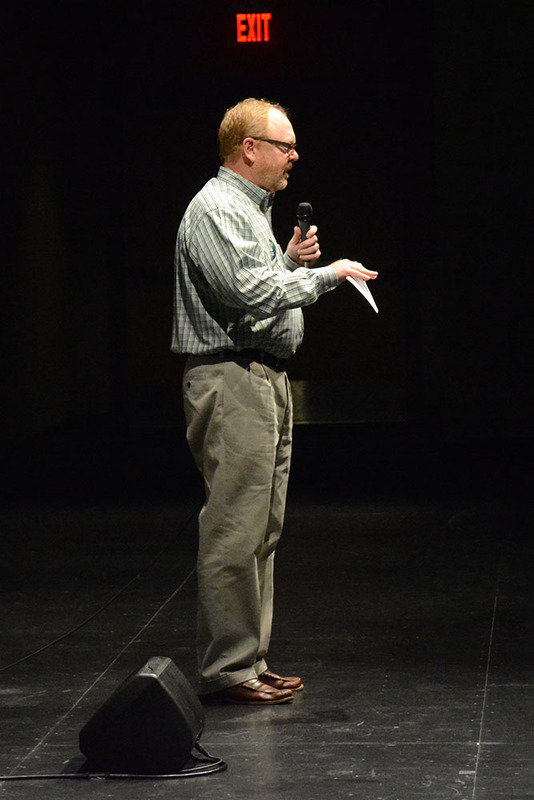 Photo by Jeff Kronenfeld. 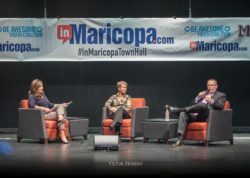 Two of the four candidates running for the two Arizona House of Representatives seats for Legislative District 11 squared off at the InMaricopa.com General Election Town Hall on Saturday. 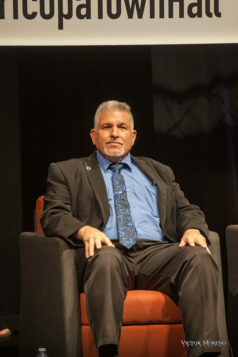 Present at the event were Col. Hollace Lyon (ret. 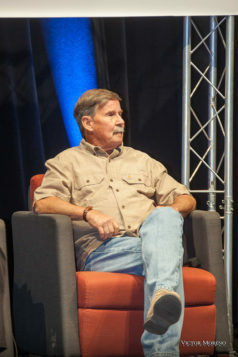 ), a Democrat, and Constable Bret Roberts, a Republican. Not present were incumbent Rep. Mark Finchem, a Republican, and candidate Marcela Quiroz, a Democrat. Several of the questions asked in the debate related to energy policy and Proposition 127, which would require private Arizona power utilities to produce 50 percent of their energy from renewable sources by 2030. It was a hot-button issue throughout the day, and Lyon acknowledged it was a tough one for her. Though she supports the proposition, she expressed some concerns about the inflexibility of the measure. She said that Arizona Public Service Electric Company (APS), makes roughly $400 million in profits annually and the CEO has an annual salary of $15 million. 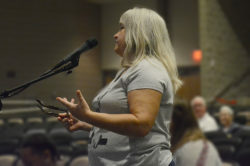 She advocated for the Arizona Corporate Commission to ensure that some of the increased costs of compliance will come out of the company’s profits, rather than passed entirely to ratepayers. 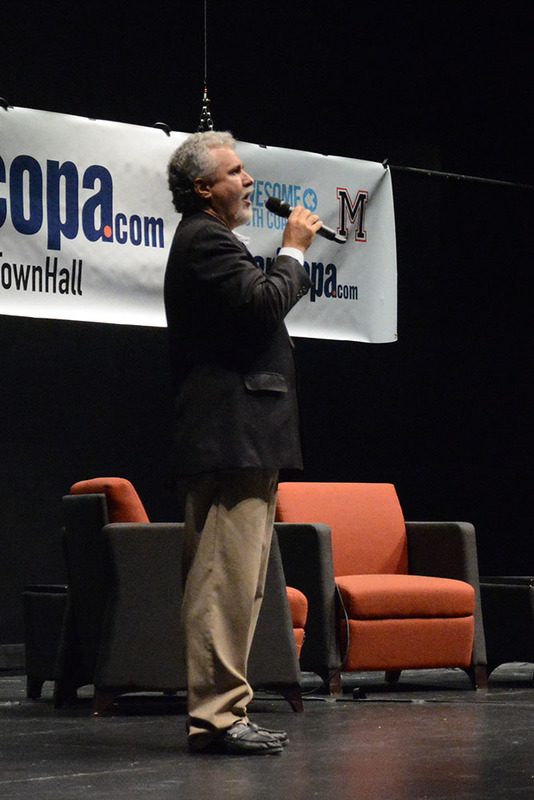 Roberts opposes Proposition 127, stating he believed it would increase individual ratepayers costs by $1,000 a year. 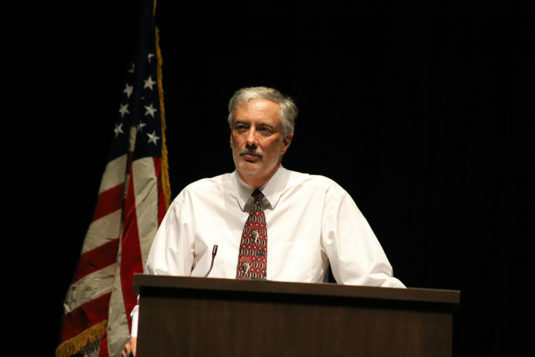 He said other countries, such as Canada, China and Japan, were divesting from renewable energy. 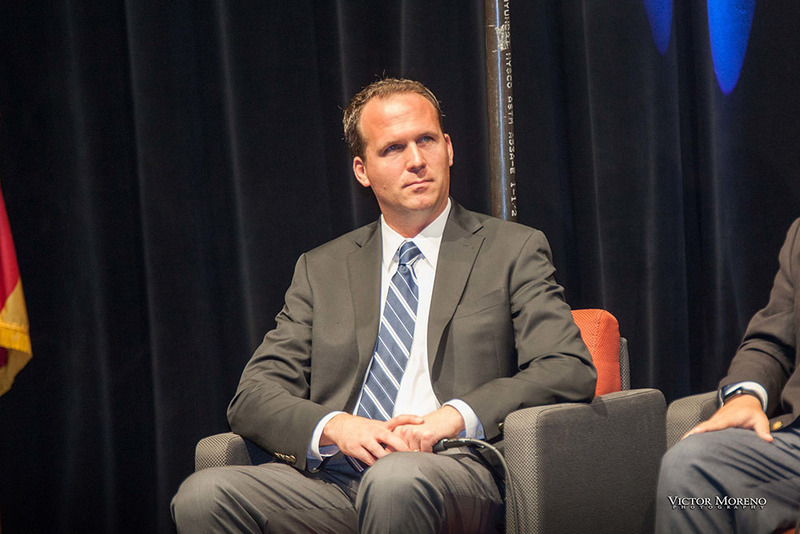 “The solar industry is kind of becoming a fossil,” Roberts said. Lyon expressed doubt over these claims. If what Roberts said about the shift in energy policy in other countries is accurate, she saw it as an opportunity to fill the void. The candidates sparred over a number of issues, such as whether Arizona should take over more federal lands within the state. Roberts was for this and Lyon opposed. 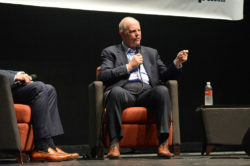 Roberts said that only 16 to 17 percent of lands within the state were taxable, while states such as New Jersey are able to tax 97 percent of their land. 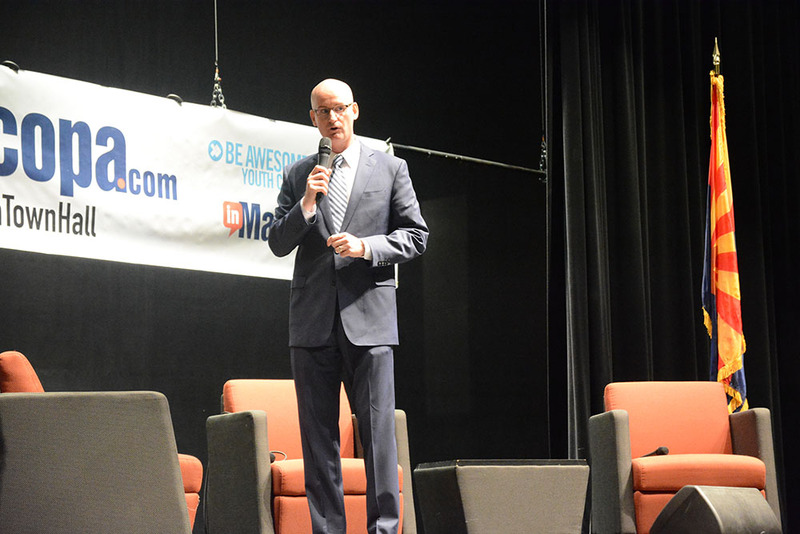 “We’re at a deficit before we even start,” Roberts said. 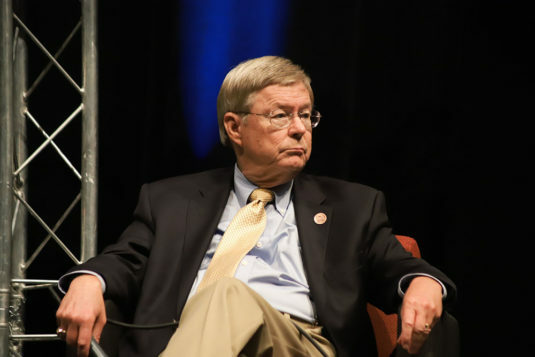 Lyon strongly disagreed, sarcastically asking what could go wrong if the state did take over federal lands, noting the Wallow Fire in 2011 cost the federal government $109 million, while the entire budget for firefighting and suppression in Arizona was only between $5 million and $10 million annually. 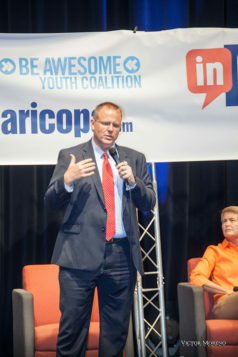 “One good fire and we would just wipe out the Arizona budget,” Lyon said. The two candidates also disagreed over tax policy. 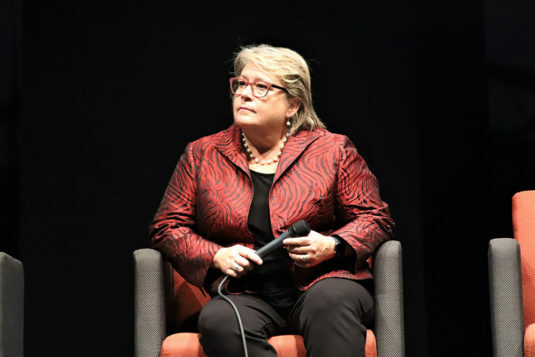 Lyon attacked what she described as $13.7 billion in tax loopholes, which she believed should be reexamined to see if they generate a sufficient return on investment to offset the loss in revenue. She also said that 74 percent of corporations in Arizona paid $50 or less annually in taxes to the state. Roberts disagreed with both points. “This tax loophole thing is just a fallacy,” he said. 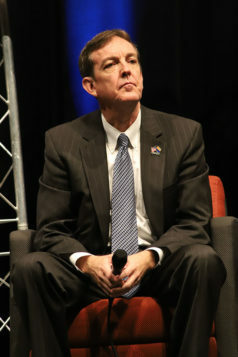 Roberts preferred the term tax policy to tax loopholes. 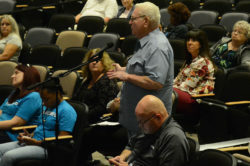 He also argued that corporations paying such low taxes generated revenue for the state by bringing new jobs and increased economic activity. Both candidates agreed they had strong differences in opinion and approaches. 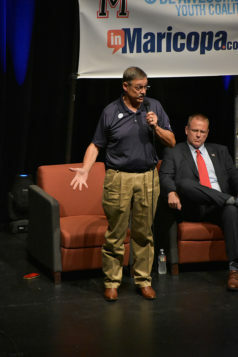 Democrat Ralph Atchue came out swinging against Republican Rep. Vince Leach in the first debate of the day for the InMaricopa.com General Election Town Hall on Saturday. 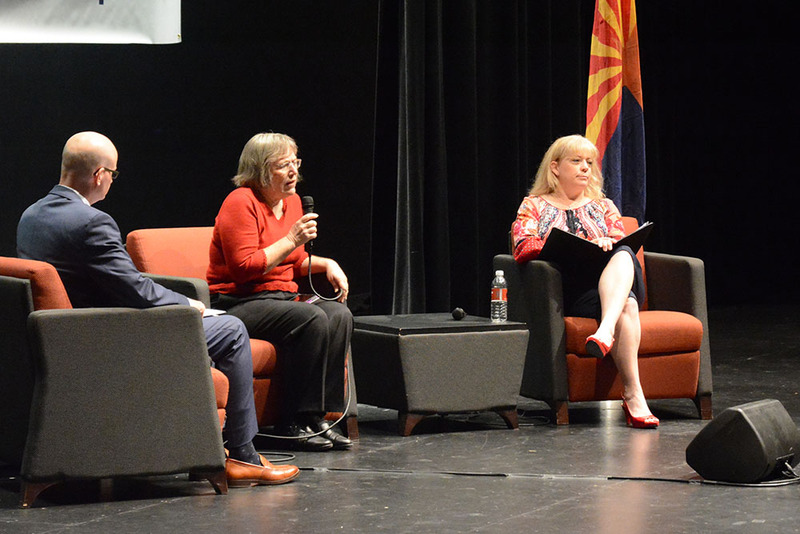 The two candidates for the state Senate seat for Legislative District 11 offered strongly contrasting views on important issues for Maricopa residents such as education, taxes, prisons, water policy and new development in desert areas. 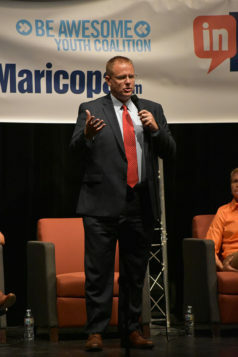 In contrast, Leach avoided personal remarks, offering a more optimistic view of the state’s current condition, though he did dispute Atchue’s claims a number of times. The positions of each candidate generally corresponded to that of their party. 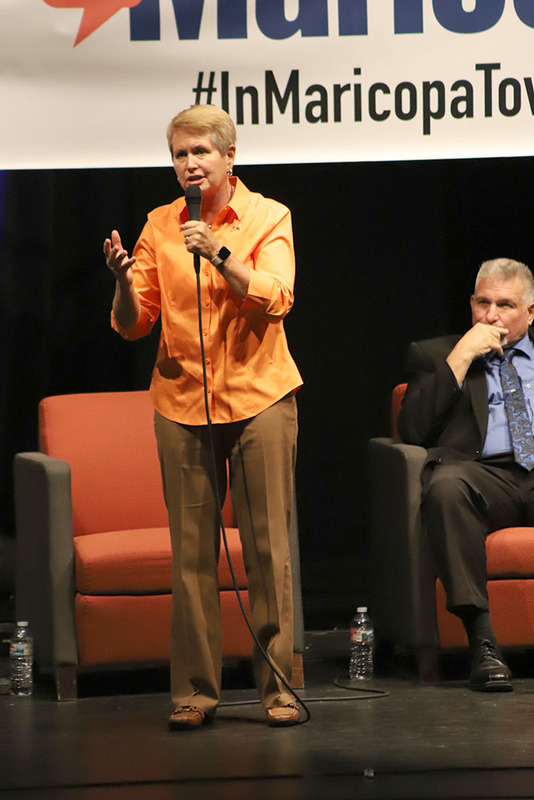 Education funding levels were front and center throughout the debate. Leach argued only slight increases in state revenue would be needed to fully fund Gov. 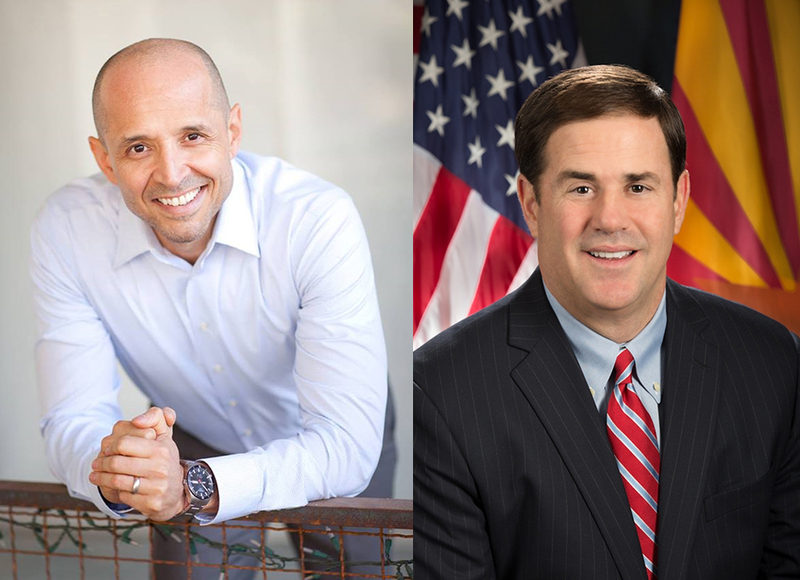 Doug Ducey’s planned 20 percent increase to Arizona public school teachers’ salaries by 2020. 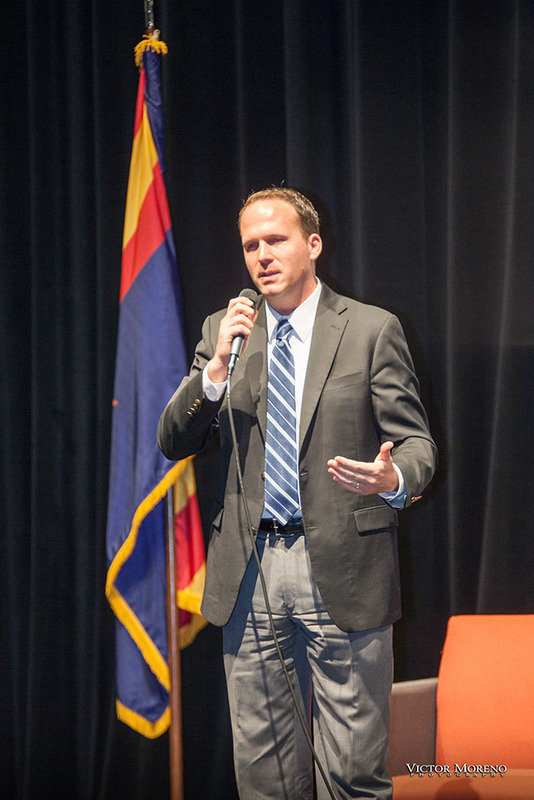 “We’ve put $2.7 billion back in the school system since I came in 2015,” Leach said. Atchue rebutted this with a scathing criticism of Leach and Gov. 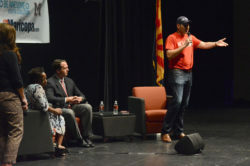 Ducey’s education policy, stating the Republicans initially offered teachers only a 1 percent increase in pay, relenting to the greater increase only after tens of thousands of teachers walked out of schools in April. AnnaMarie Knorr, president of the Maricopa Unified School District governing board, served as the moderator and opened the debate by asking whether current taxes in the state were too high, too low or just about right. 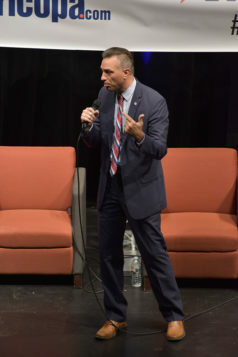 Atchue said taxes were “out of balance.” He proposed an audit of the state’s current tax scheme, attacking what he described as tax loopholes and tax credits, which he claimed offered little return on investment. 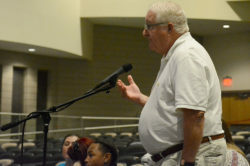 “Because the state has abdicated it’s responsibility for funding things like public education, infrastructure, juvenile detention, many things, the tax burden has been pushed onto counties and cities who have no recourse but to raise sales taxes and property taxes,” Atchue said. 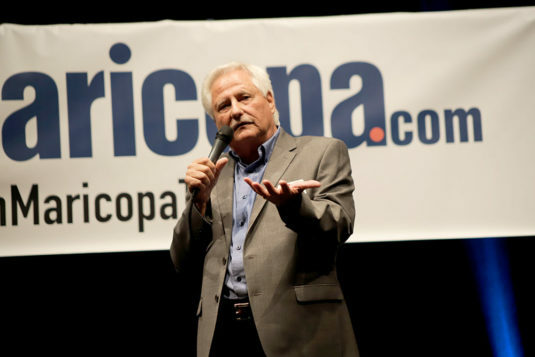 Leach acknowledged the state had experienced “tough times” in the past, mentioning a one-time budget shortfall of $3 billion, but said Arizona was now experiencing increasing revenue. 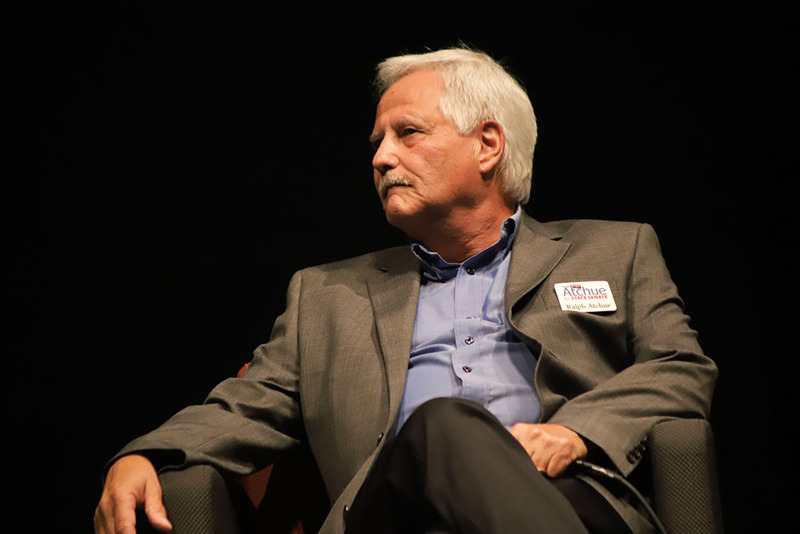 Leach cited lowering taxes and other pro-business policies as responsible for attracting new residents and businesses to the state. 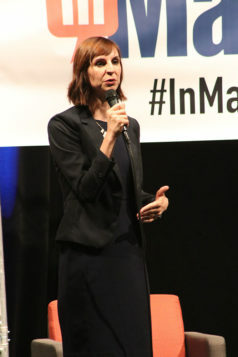 Atchue disputed this last claim, arguing the state’s climate was more responsible for attracting new residents than its tax policy. The two candidates also differed on infrastructure issues, though both agreed on the need to improve dangerous intersections and to expand road capacity. 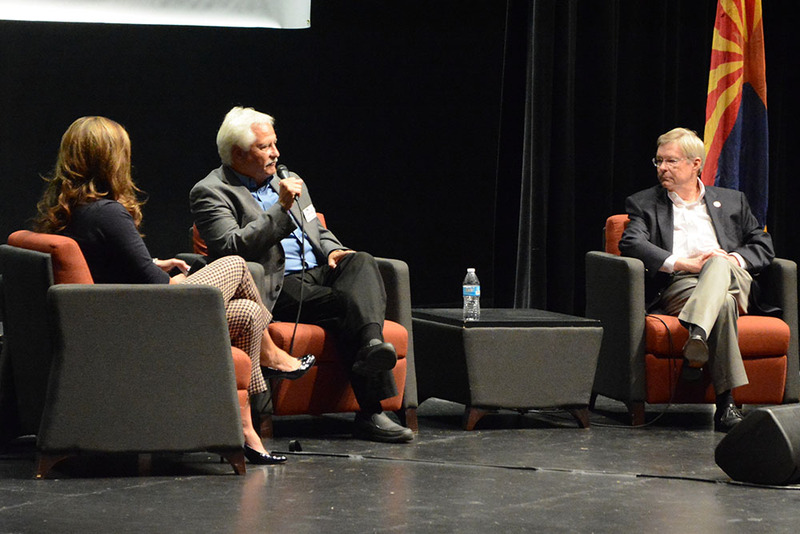 A question about the use of private prisons demonstrated a strong difference of opinion between the candidates. 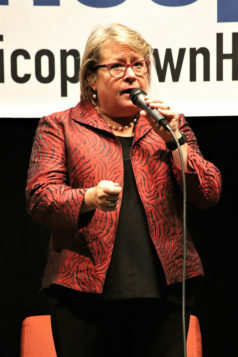 Leach supports the use of private prisons when cost-effective and claimed prison populations in the state were declining. 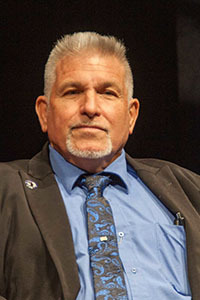 Atchue disputed that prison populations are decreasing and did not support increasing the use of private prisons. As both candidates’ forceful closing remarks made clear, residents of Maricopa have two very different options available in the senate race for Legislative District 11 this November. General Election Candidates: Who do you pick? The General Election is Nov. 6. The following are candidates for office that affect Maricopa. 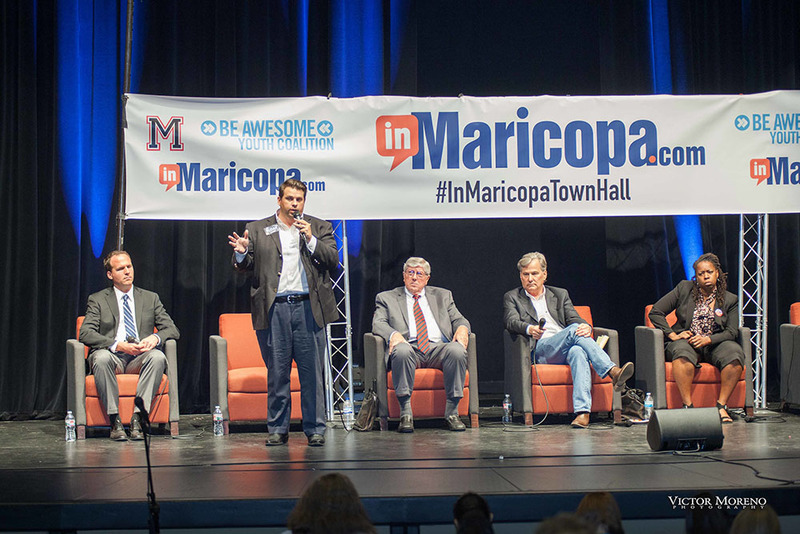 In purple are candidates you will see at Saturday’s Town Hall in Maricopa. 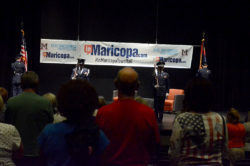 Learn more at MaricopaEvents.com. This item appears in the October issue of InMaricopa. Photos of Attorney General candidates have been corrected from the printed version. We apologize for the error. State Rep. Vince Leach (left) and Democrat opponent Ralph Atchue at a feisty debate in August, are scheduled to appear in an Oct. 6 InMaricopa.com Town Hall for the General Election. Photo by Angelica Ramis. 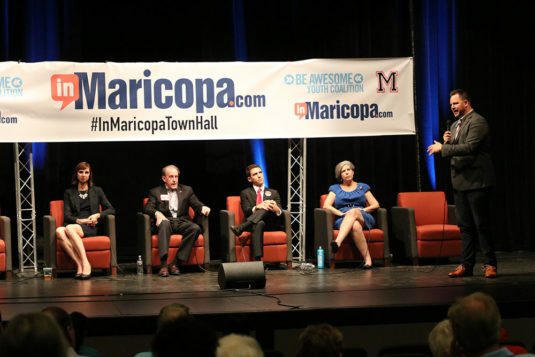 The InMaricopa.com General Election Town Hall is set for Oct. 6 from 10 a.m. to 2 p.m. at Maricopa High School’s Performing Arts Center. State and local candidates will discuss the issues with their opponents and take questions from the public ahead of the Nov. 6 election. The event is free to attend. RSVP at MaricopaEvents.com. 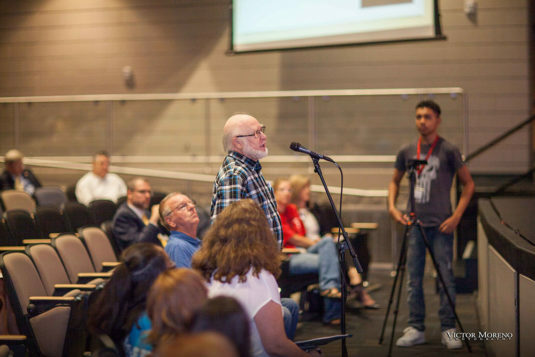 In a survey of attendees after the Primary Election Town Hall, more than 90 percent said the event affected the way they would vote. The morning block starting at 10 a.m. will have candidates for state house and senate for Legislative District 11. 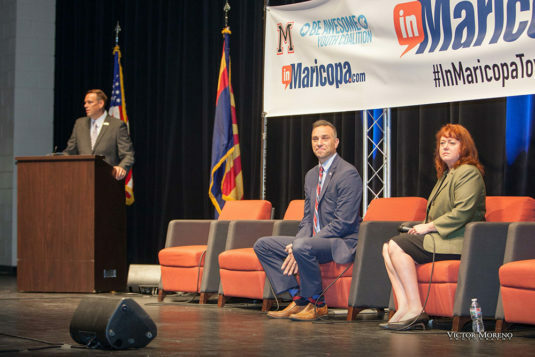 The afternoon block starting at noon will have candidates for Arizona Corporation Commission, constable and more offices. The rules for candidates and audience alike are simple: Be respectful, be succinct and stay on topic. The town hall is in partnership with Maricopa High School and Be Awesome Youth Coalition. Doors open at 9:45 a.m. A LEGO pool supervised by Be Awesome Youth Coalition volunteers will be available for children whose parents wish to attend. 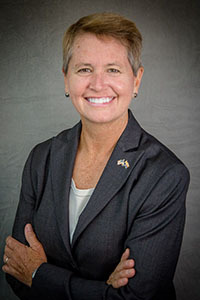 Wendy Rogers is the Republican front-runner in the early counting for CD1. 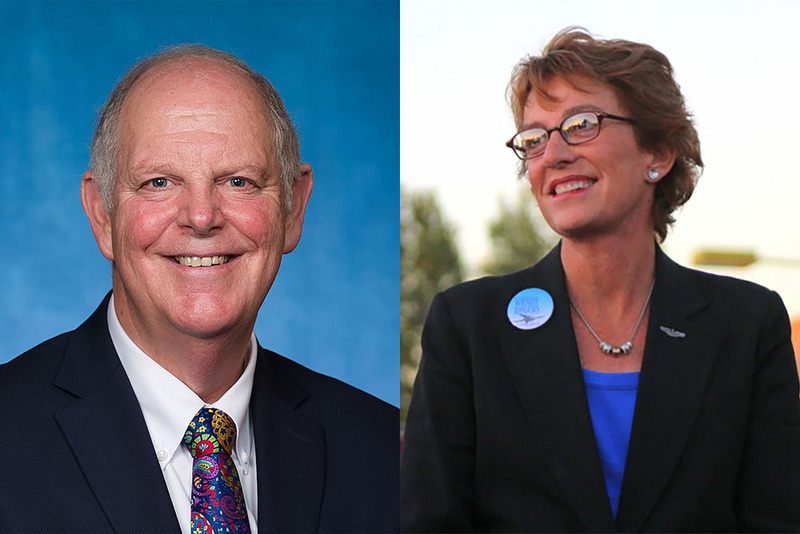 Competing for a chance to face off with Democrat Tom O’Halleran in the fall, Maricopan Steve Smith trails Wendy Rogers by more than 2,000 votes. 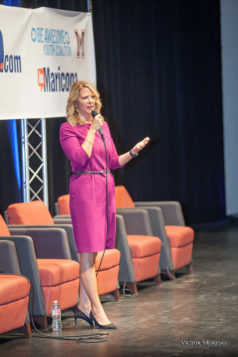 Tiffany Shedd is a distant third in the Republican Primary for U.S. Congress District 1. 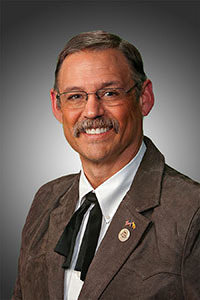 Smith is currently the senator from Legislative District 11. Still waiting for seven counties to fully report, Rogers had 20, 564 votes to Smith’s 17,879. 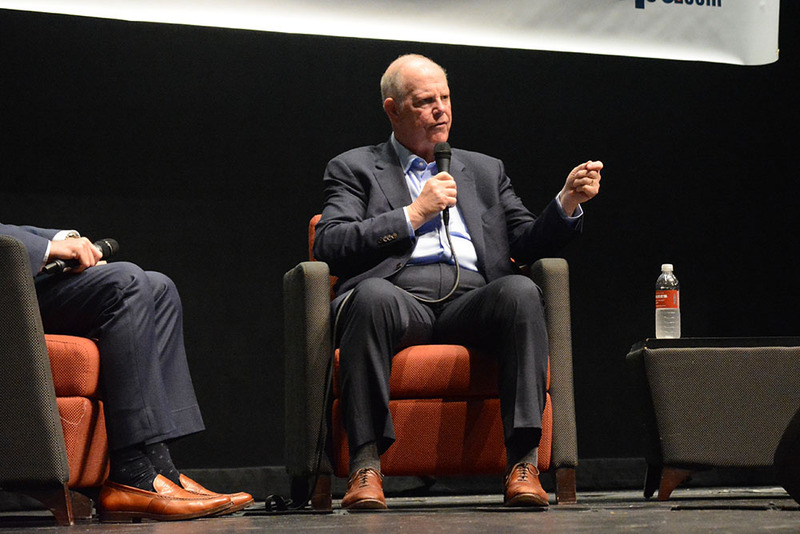 Meanwhile, O’Halleran, the incumbent, was unopposed in the Democrat primary. 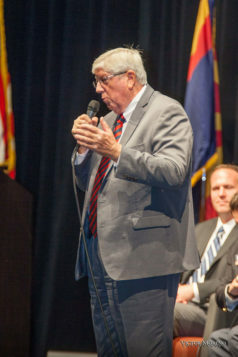 While Justice of the Peace Lyle Riggs had no competition in the Primary Election (nor in the upcoming General Election), there has been a battle for the constable of the Maricopa/Stanfield JP Court. 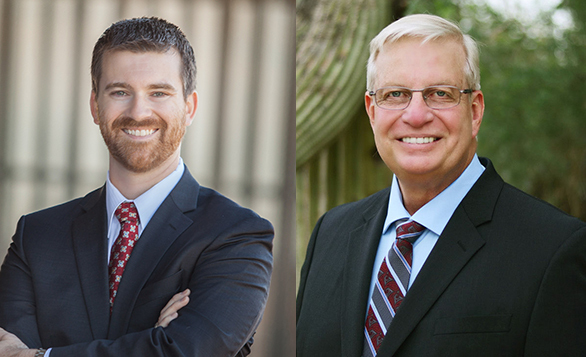 With only seven of 16 precincts reporting Tuesday, Glenn Morrison has a lead over fellow Republican Bill Griffin – 53 percent to 46 percent. 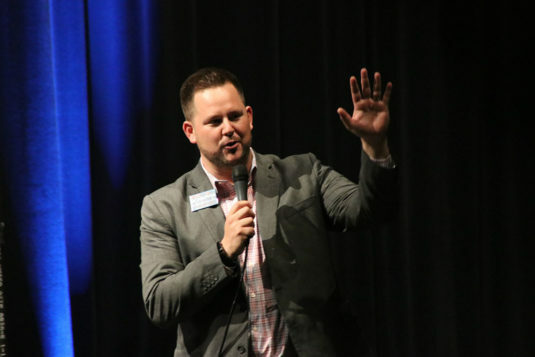 They are vying to replace Bret Roberts, who is on track to reach the General Election in the race for House of Representatives for Legislative District 11. The eventual winner of the Republican Primary will meet Democrat Andre LaFond in the General Election. 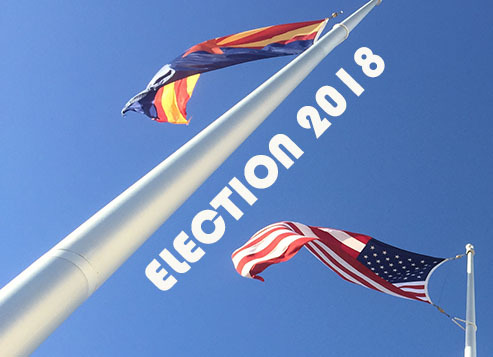 With early ballots counted and eight precincts reporting out of 11, Rich Vitiello and incumbents Henry Wade and Vincent Manfredi lead the eight-person field of Maricopa City Council candidates. 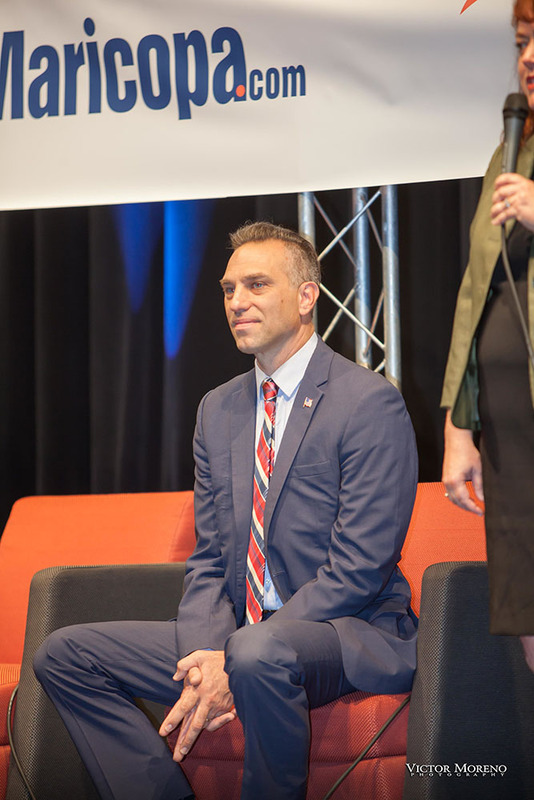 In the Primary Election, Vitiello received the highest number of votes among the early ballots with 1,495 and overall has 21.18 percent of the votes. Wade totaled is at 18.61 percent and Manfredi 17.11. Votes cast at the polls and provisional ballots are still being counted by Pinal County. 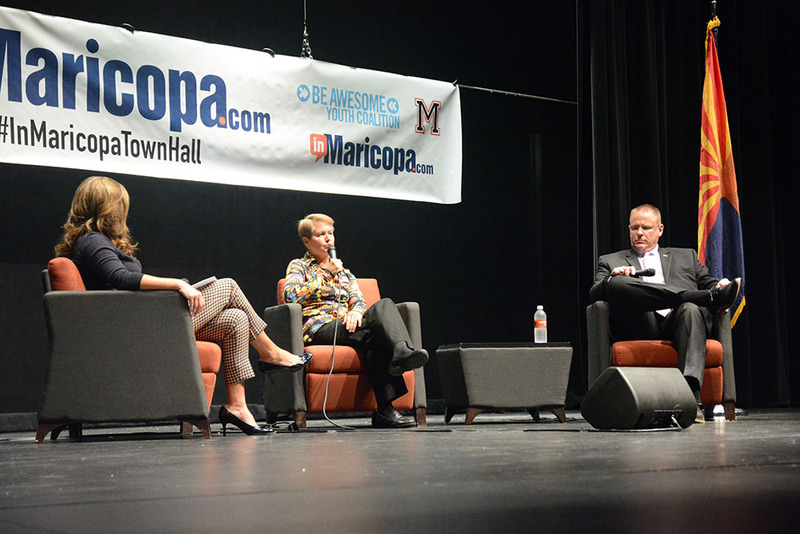 Maricopans are electing three councilmembers. Currently just behind Manfredi, Bob Marsh has 13.98 percent. Cynthia Morgan has 10.87 percent, Linette Caroselli 10.19 percent and Paige Richie 7.2 percent. 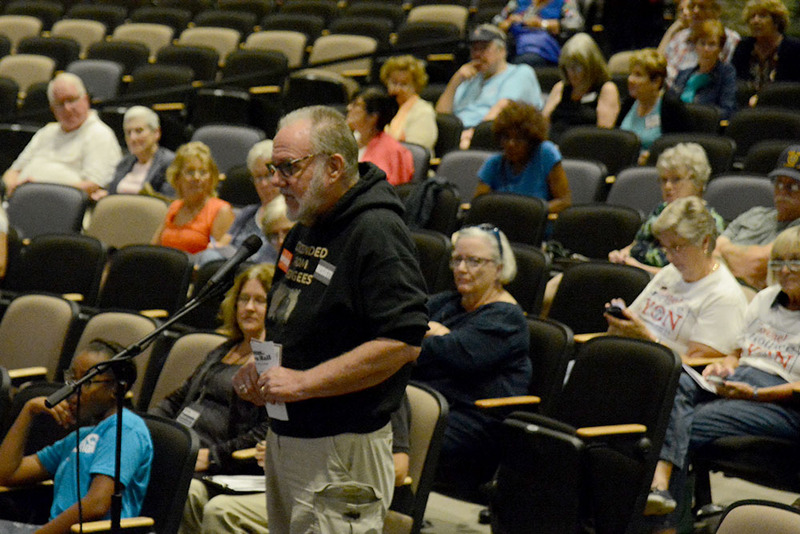 There were 69 write-in votes cast in the early ballots. The registered write-in candidate is Leon Potter. 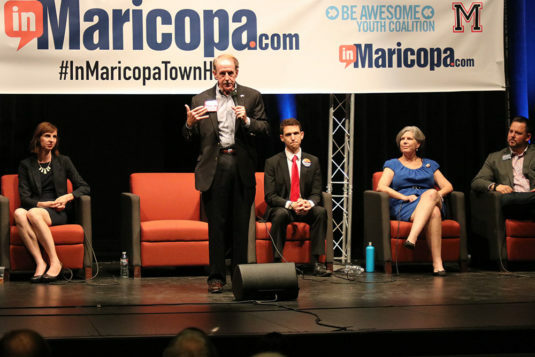 One or more candidates could be elected outright in the primary results. Others could continue on to the General Election in November. 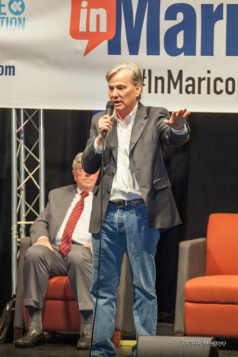 Manfredi is minority owner of InMaricopa. 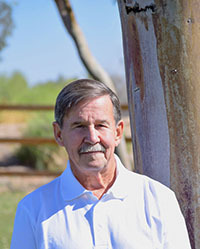 It is with great pleasure that I provide Leon Potter with my full endorsement as he seeks election onto the City of Maricopa’s Council. Mr. Potter is running as a write-in candidate and I have had the pleasure of serving with him on our City Council. 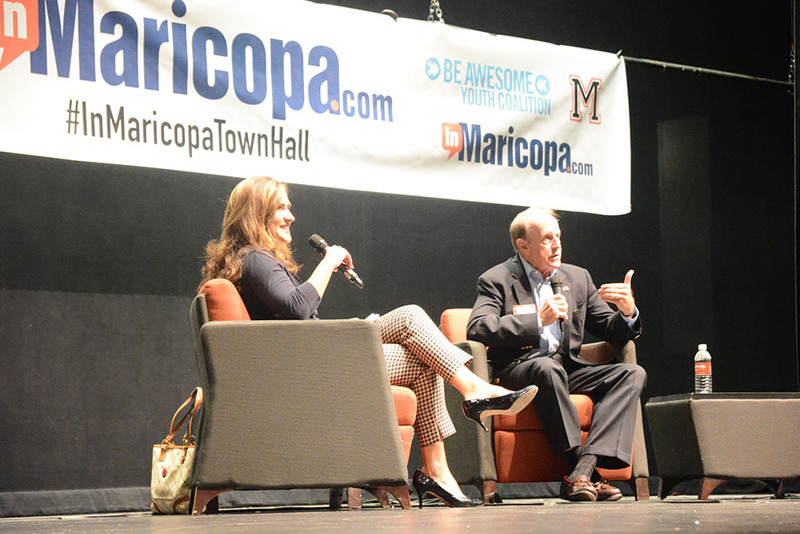 I am of the belief that our city is headed in a good direction, but has stalled along the way. Furthermore, it is my opinion that change is needed to push and accelerate our progress. 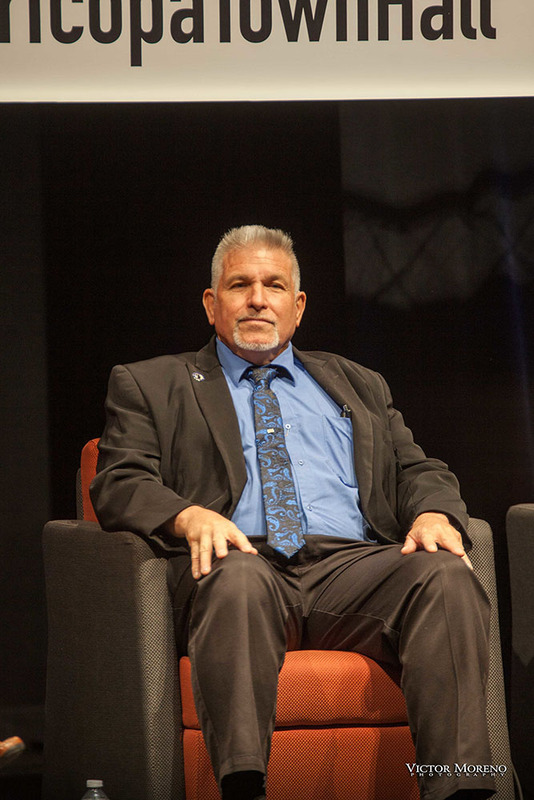 He has proven to me, and to this community, that he does not go along to get along and does not subscribe to the status quo of our current leadership. 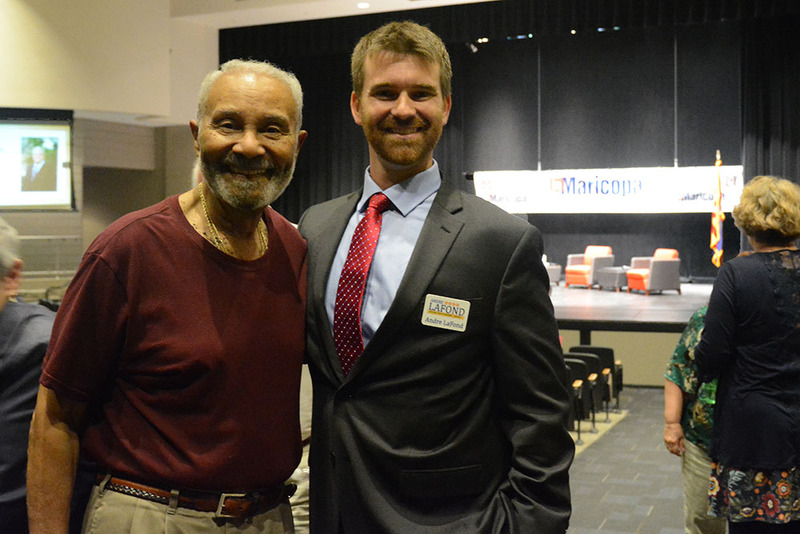 For those reasons, I am happy to provide him with my endorsement and I wish him nothing but luck and good will as he pursues a seat on our city council. Julia R. Gusse is a member of the Maricopa City Council. 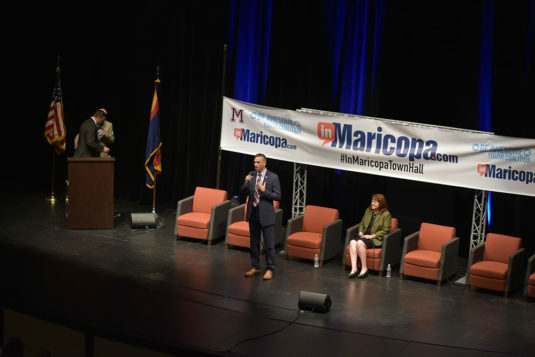 Candidates running for state and legislative seats answered questions from the public at the InMaricopa.com Town Hall Saturday. From Arizona Corporation Commission to treasurer, they address a wide range of issues. Maricopa resident Tena Dugan asked candidates campaigning for seats on the Corporation Commission what they would do for Global Water Customers. 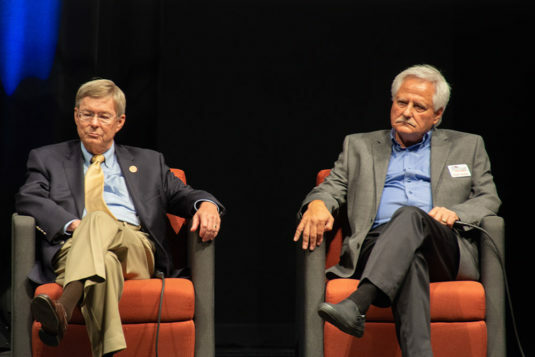 Candidates largely referenced claims of corruption on the current commission and their promises to act in consumers’ best interests on how they would protect local water customers. 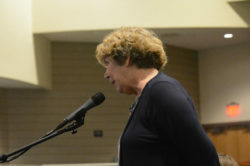 Former Commissioner Sandra Kennedy, who is fighting to return to the commission, said she has experience with the company. 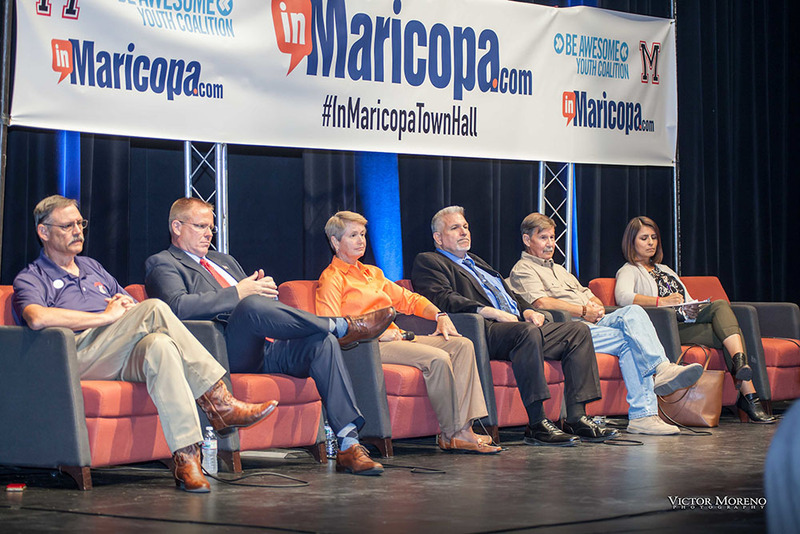 Six State Representatives candidates for LD 11 discussed SR 347 funding, taxes and higher education funding. 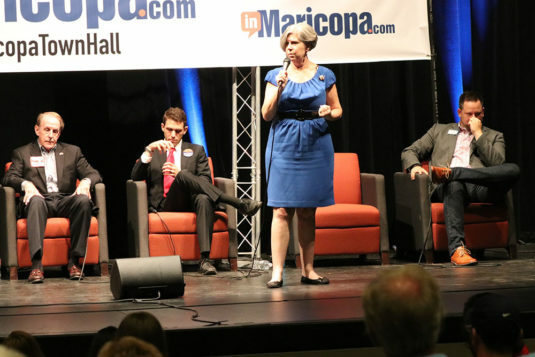 Maricopa Councilmember Nancy Smith took the microphone to confront one incumbent and the other five hopefuls on how they would stop “passing the buck” to cities and counties while balancing the state budget. Smith said in the past, state budgets have cause Pinal County to increase taxes and the city to forego helpful programs to residents. Democratic candidate Hollace Lyon said the state should “collaborate, not dictate” with cities and towns. 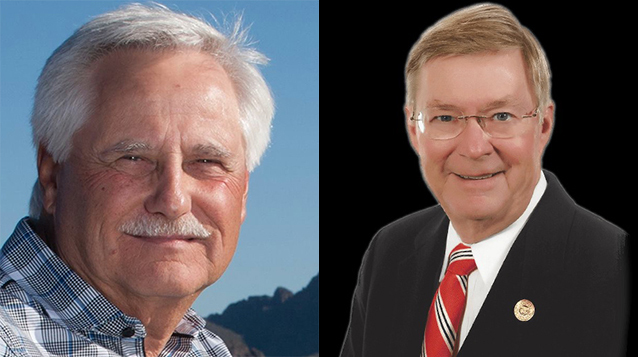 In the LD11 Senate race, in which there is no primary election, Republican Vince Leach, in his second term in the state house, and Democrat Ralph Atchue tackled public education funding and charter schools. 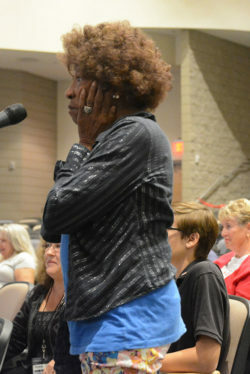 Talitha Martin, MHS English teacher, asked Leach if he supports transparency in public dollars spent by charter schools. Leach said he does, as outlined through state statute. “(Charter schools) have their own rules. You may not like that, I get that. 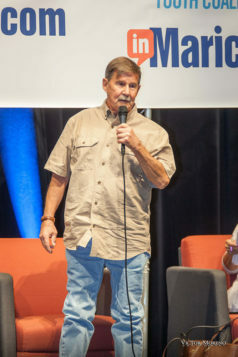 You may not like that, but that was set up in 1998 and that’s how it is,” Leach said. 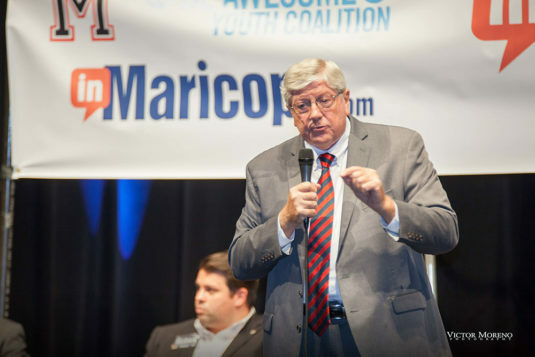 Leach referenced an article from U.S. News and World Report that he said showed Legislative District 11 boasts nine of the top 29 schools in Arizona. “Charters are filling up overnight. Why are they filling up? 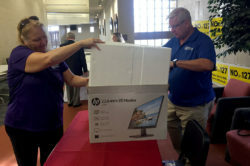 Because they are getting a better education,” Leach said. 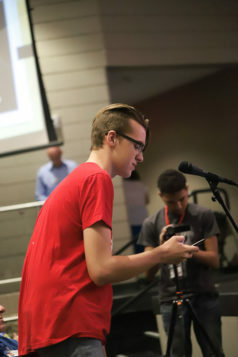 “If things are so great in Arizona why are we losing teachers every day to other states?” Atchue asked. 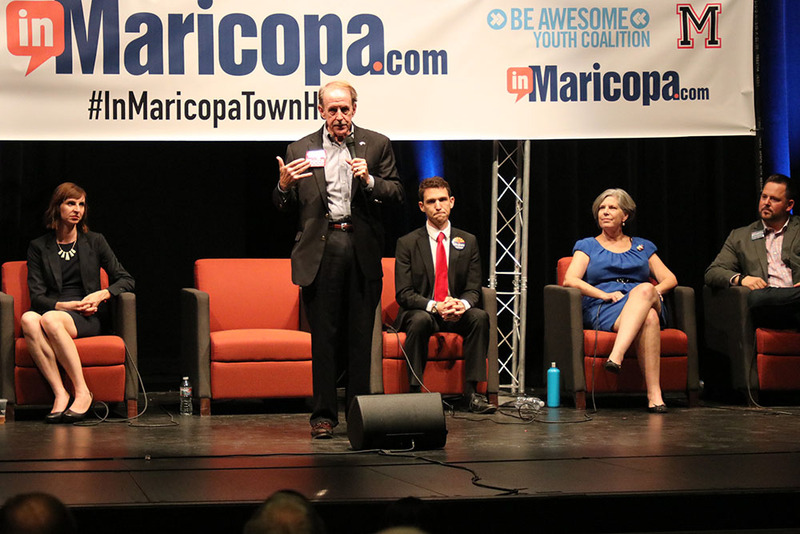 Maricopa/Stanfield Justice Court Judge Lyle Riggs facilitated the non-primary governor debate between Kelly Fryer (D) and Ken Bennett (R), as well as the treasurer race featuring Republican Jo Ann Sabbagh, the first accountant to run for the position. 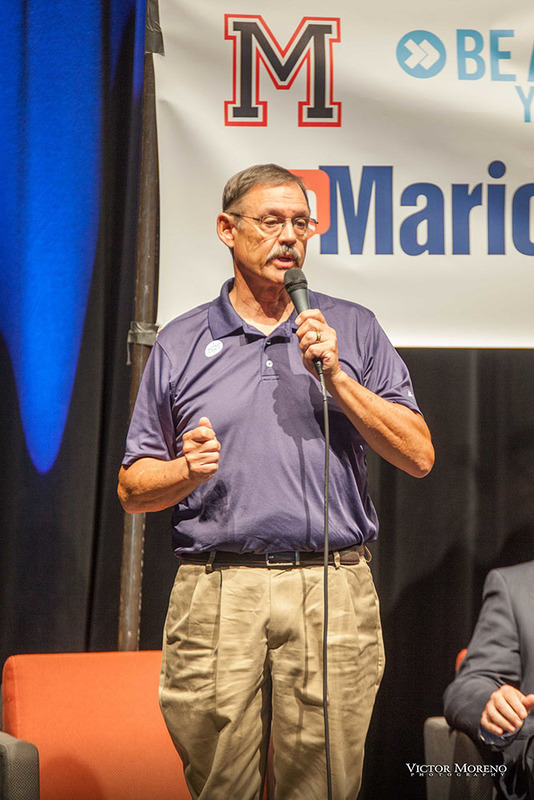 MHS Educator Rick Abel moderated candidates campaigning to be Superintendent of Public Instruction. The race includes candidates with public and charter school backgrounds. 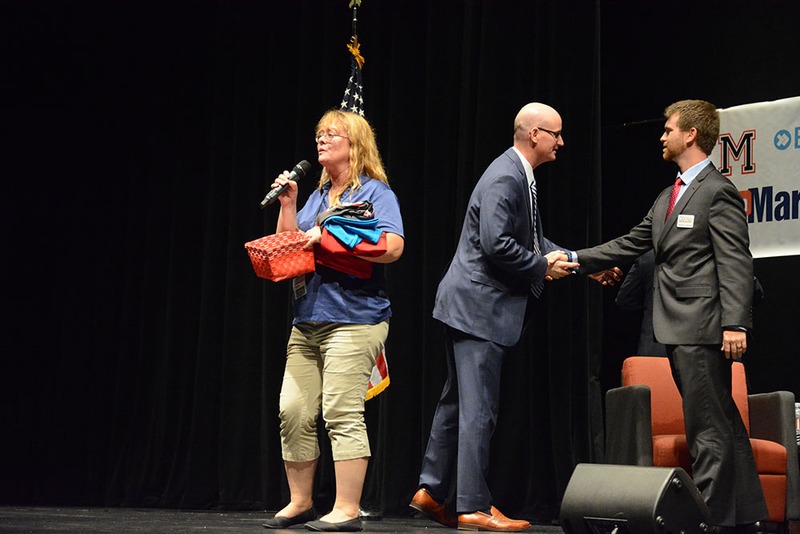 The debate predictably touched on education funding and school safety, as well as improving services for gifted students. 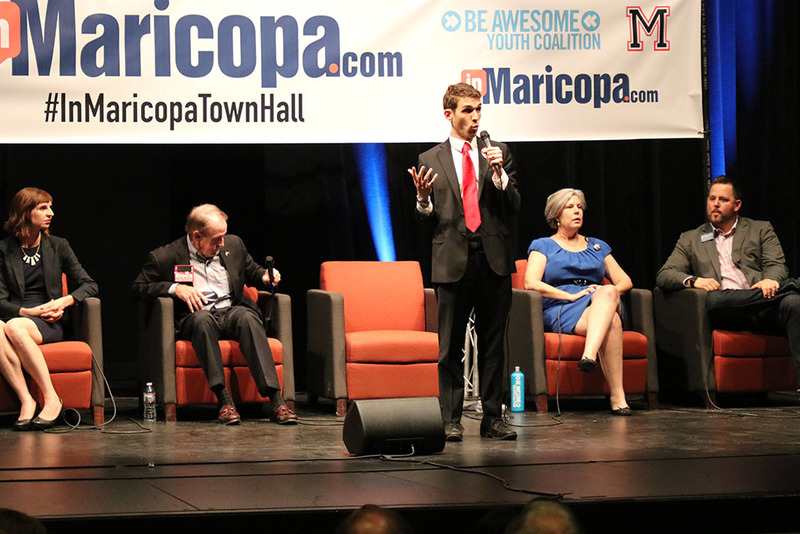 The eight-hour marathon town hall event at Maricopa High School featured debates from 11 Arizona races. The event was organized by InMaricopa.com and broadcast live on Facebook. 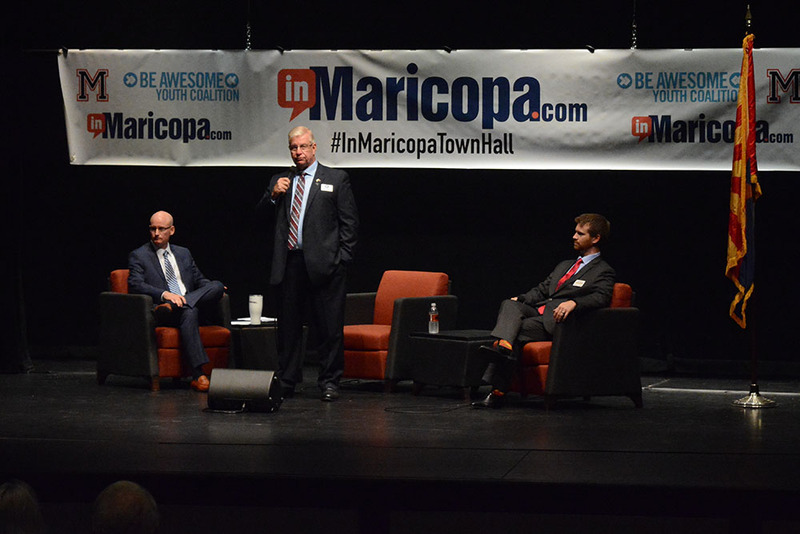 To view the full debates, visit the InMaricopa Facebook page. 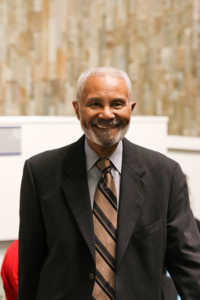 Political background: Currently serving second term as representative for Legislative District 11. As a two-term Representative in LD-1 Mark Finchem has stood firm for personal freedoms, economic security, quality education and a debt-free future for constituents. Originally from the mid-west, Mark has leveraged his work experience in law enforcement, computer software security and real estate to serve people in many different ways. 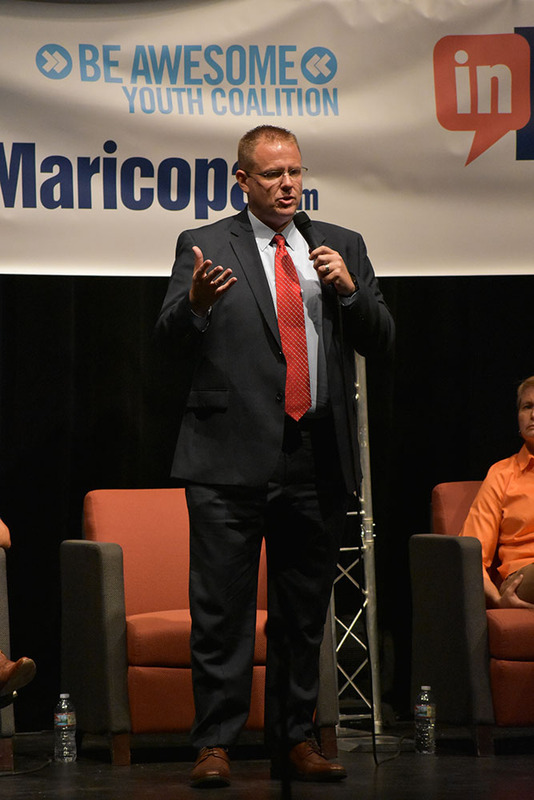 As the front runner for House Majority Leader in the coming legislature term, he will give southern Arizona a seat at the leadership table. Family: Four grown daughters and grandchildren. 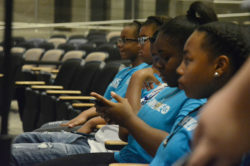 Other community service: Served on the Michigan City Urban Enterprise Board of Directors. How will your election benefit the residents of Maricopa? I am the outsider who owes no one anything. 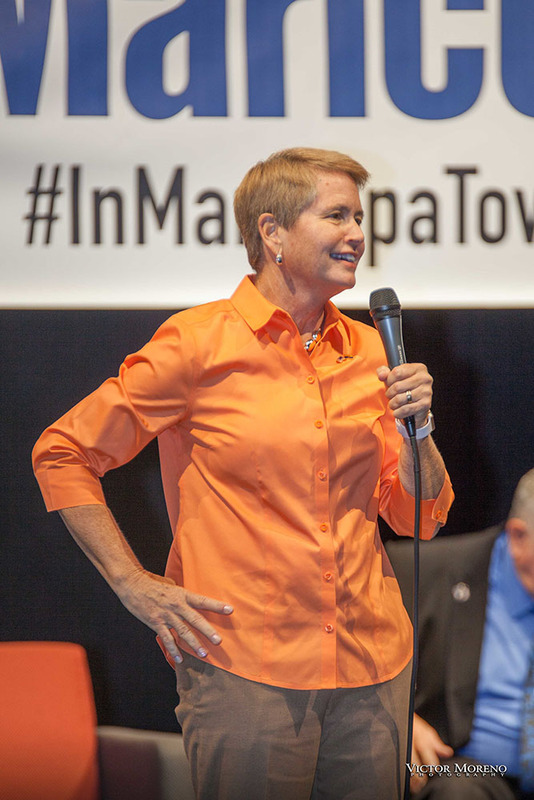 I am able to act in the best interest of the people to promote growth in the area. What do you think was the best accomplishment of the most recent session of the Legislature and why? I know the budget was a big issue but for me it would have to be S.B. 1394. I am pro-life and anything that can be done to save one I think is very important. 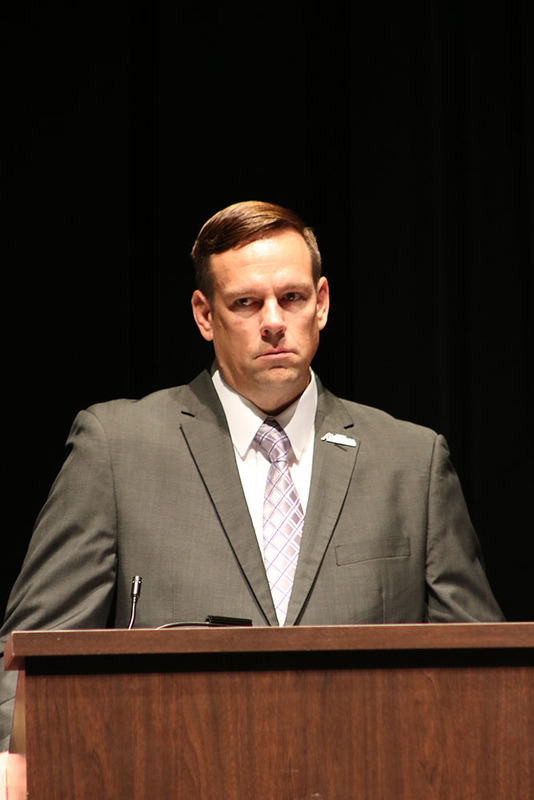 What was your biggest disappointment in the most recent session of the Legislature and why? 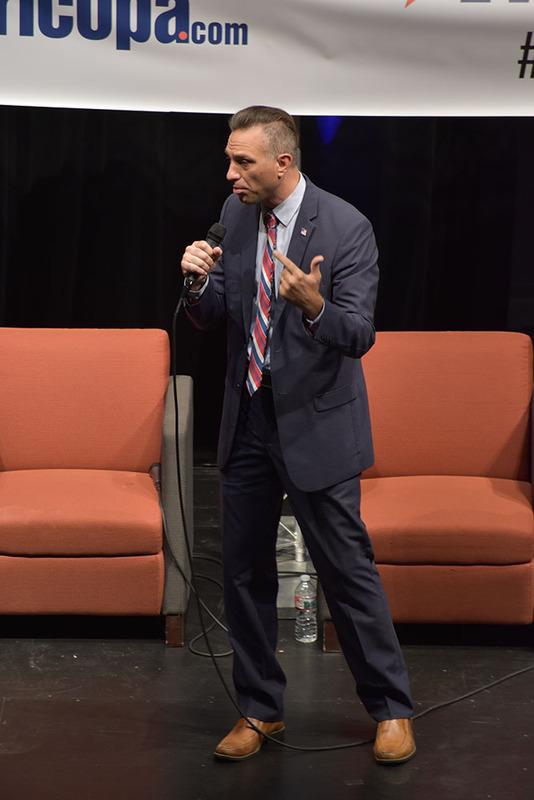 The reason I am running is to stop the Legislature from putting out bills that look good on the surface but do nothing to fix the problem they were meant to address. 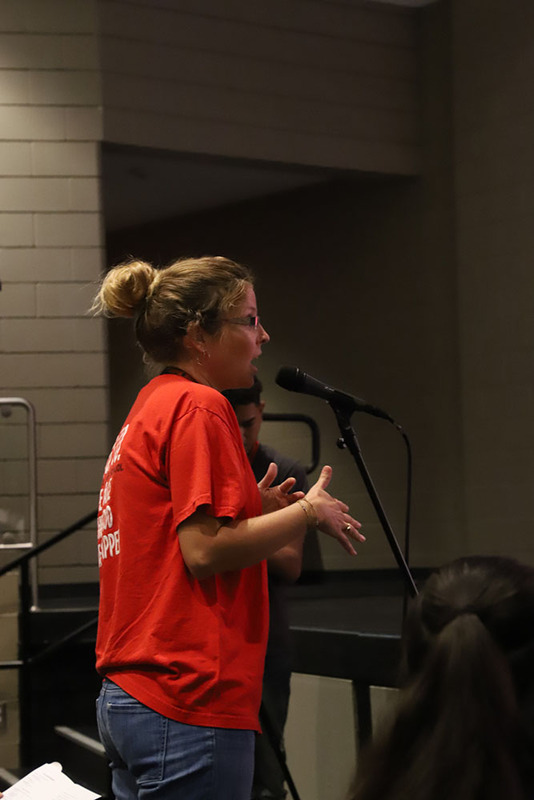 In the wake of the #RedForEd movement and the education bill, how would you describe the current relationship between Legislators and Arizona teachers? From what I have seen in the news the relationship is not very good. What is the greatest change you would like to see in any department of Arizona government? I believe there is always room for improvement in all departments but I think ADOT could use special attention. They are doing a good job but without constant improvements thing can get decline quickly. 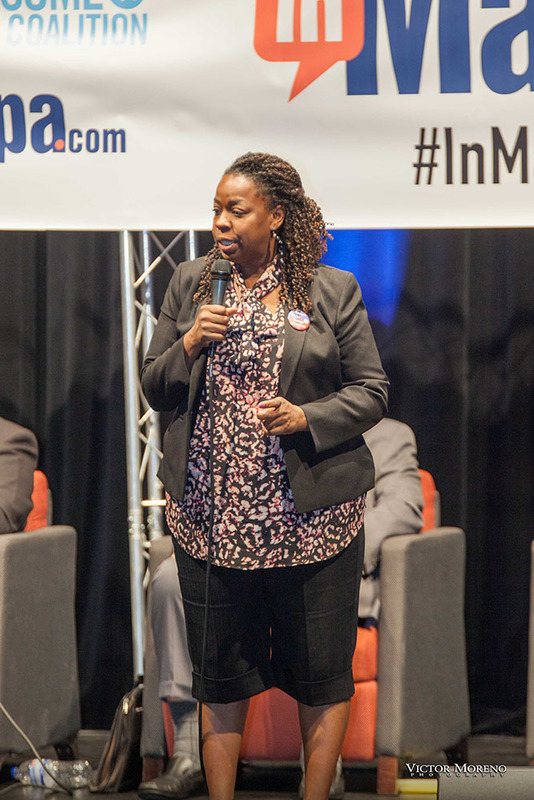 How are you more qualified for a House seat than your Primary Election rivals? 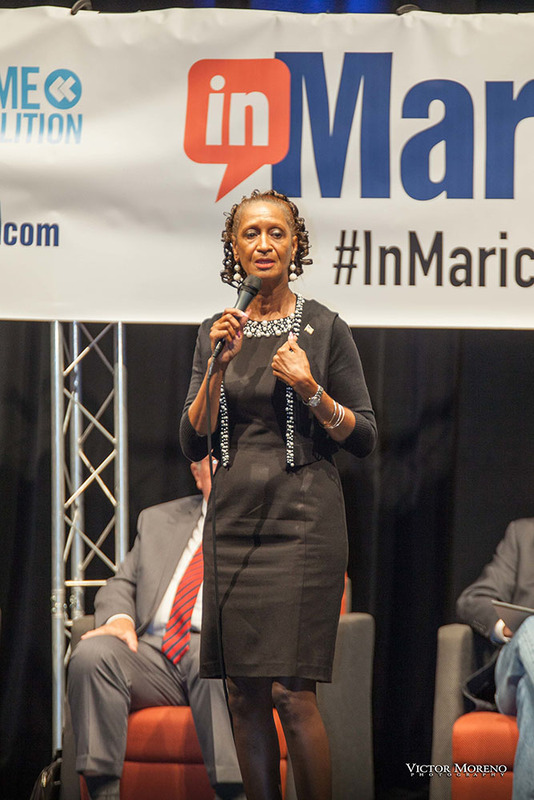 I am not saying I am more qualified but that I bring a different perspective to the seat and I believe in term limits. How will you stay connected with the concerns of your constituents during your term? I will encourage people email me with their concerns and problems. 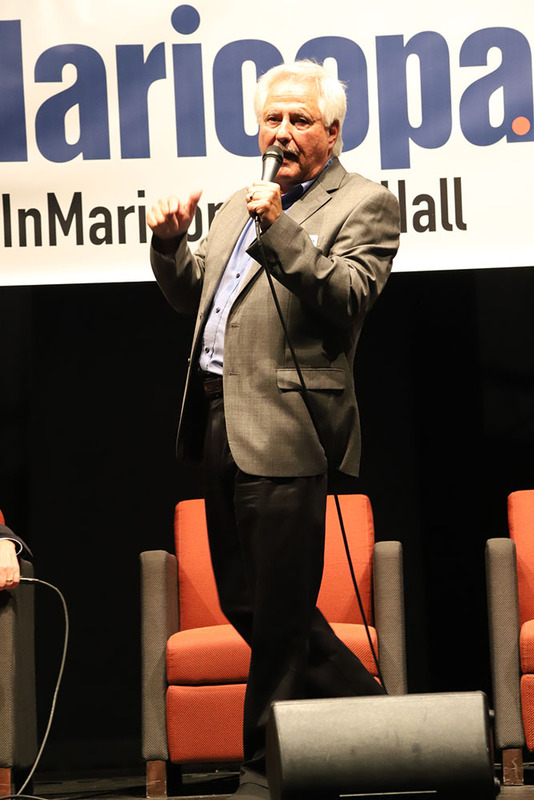 I will also be looking at town hall type meetings if I can get enough people to participate. Family: Married with 3 grown children and a two-month-old baby girl. 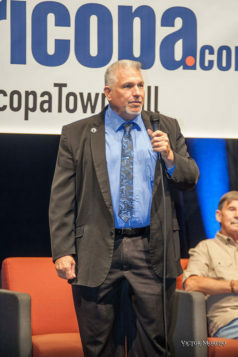 Other community service: 2013 Graduate of Maricopa Leadership Academy, the second person to achieve Platinum Status in the Maricopa Advocate Program. I have also volunteered for the F.O.R. 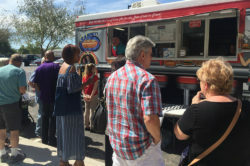 Food Bank, For Our City Maricopa, Relay for Life, sponsored by the American Cancer Society & The Streets Don’t Love You Back a charitable organization. First and foremost, my family and I have lived in the city of Maricopa since January of 2009. 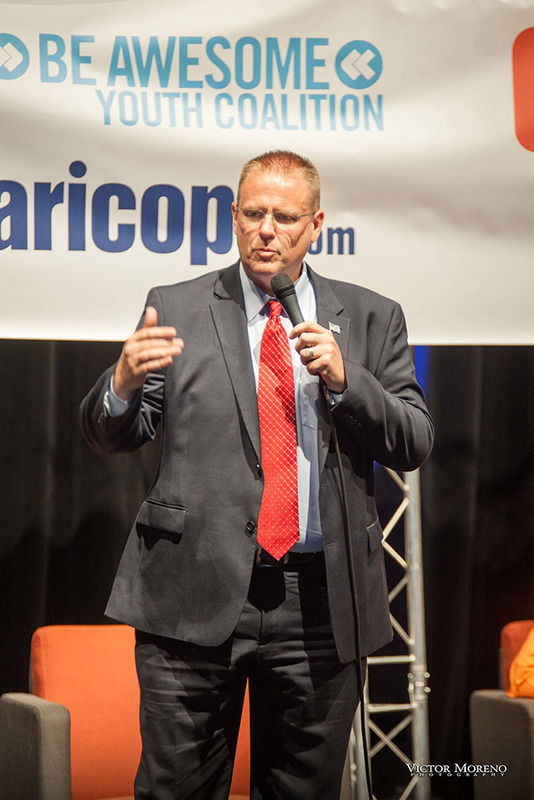 I have been serving, (pun intended) the city of Maricopa and the surrounding area as your elected Constable for going on four years now. As much as I can I intend to serve the constituents as equally as possible however, as a resident naturally you are a little more in tune with your immediate surroundings. Once elected I will continue to serve Maricopa’s residents in what I believe to be a more impactful position as their Representative at the legislature. I am a supporter of education, and truly believe that education is one of the most critical issues in this state especially when it comes to economic development. Seeing that the legislature was able to get considerable additional revenue into Arizona’s education system with out raising our taxes is an impressive accomplishment. It’s a work in progress. I believe that almost all of us care about education. Where we may have a difference of opinion is how do we go about achieving the goal. This is a personal issue for our family and I would like nothing more than to find a way to make it easier, even if it’s only a small percentage of the approximately 17 thousand children in the foster system in Arizona. About two years ago we attempted to adopt a child from an out of state family member. Unfortunately it didn’t work out. During that time, we were told that we were not closely enough related to avoid all the red tape even though the mother was willing. Essentially, we had to go through everything like we were strangers. I understand the system must look out for the welfare of the child, however if there is a family member willing to take a child even if they are ten times removed I believe they should be able to do so and be allowed to complete all the needed details after. Especially if this will keep the child or children with family instead of being placed in the foster system. 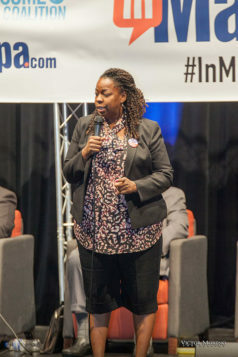 My diverse background which includes past business ownership, the financial sector, transportation and currently your elected constable will all afford me the opportunity to see the issues that come across your representative’s desk with the capability of seeing these issues from many different perspectives. I believe this will be an advantageous skill set to a legislator. I am involved all year round and not just when the election seasons rolls around. You see me at Fry’s and at Native Grill. I am a part of this community as much as it is a part of me. I have been involved in the Maricopa community in many ways for several years now. I intend to continue to do so. 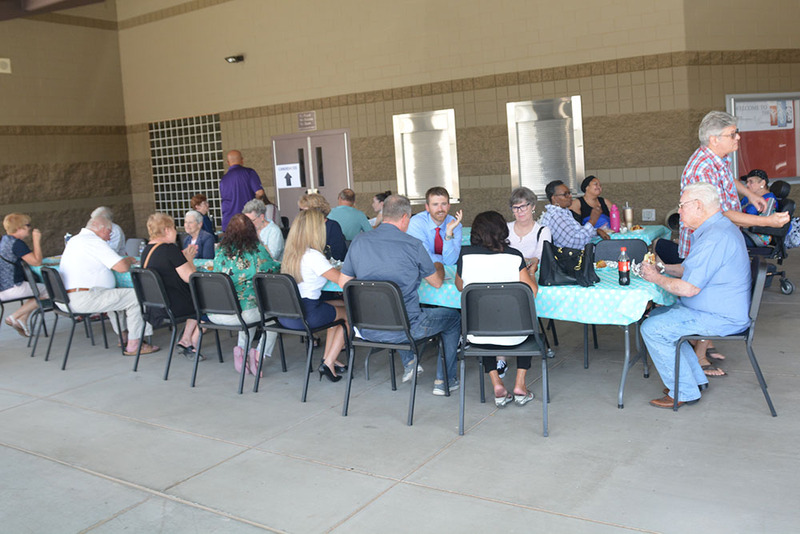 Naturally, I have broadened my involvement to include the rest of legislative district eleven and I Have been to Marana, Oro Valley, Saddlebrooke, Arizona City & Picture Rocks numerous times over the past year. All while maintaining the responsibilities of my current role. I will continue to make myself available once elected. 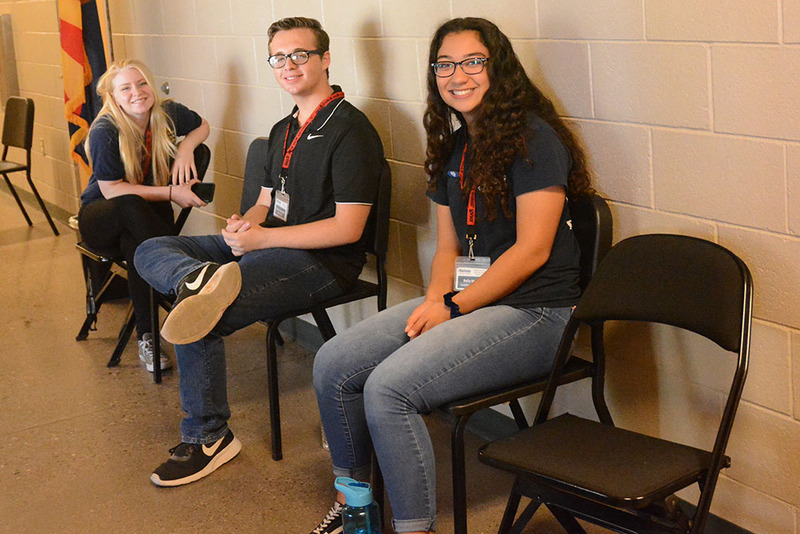 Other community service: Co-founded and ran for four years, a charity golf tournament which raised over $60K for a Tucson non-profit. Member of Oro Valley American Legion, Post 132, member of NAACP. 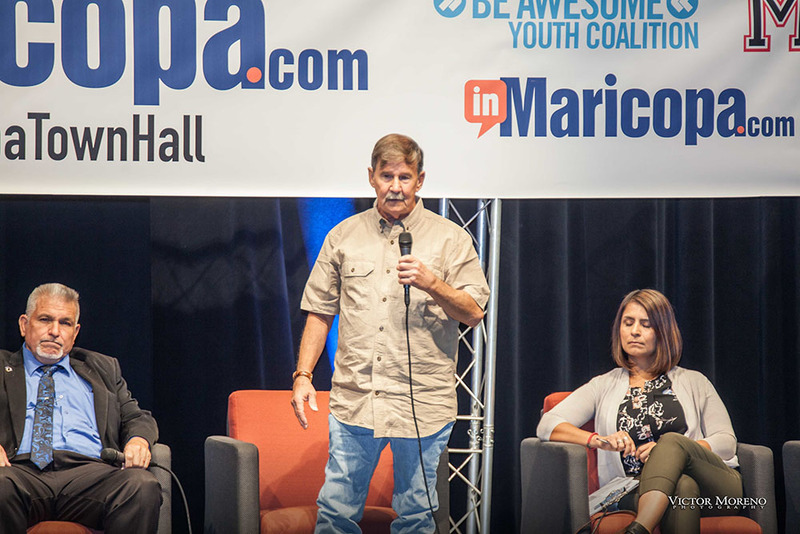 Maricopa is a great community growing by leaps and bounds. Challenges are inherent with such rapid growth and the state must provide the investments in public education and modern infrastructure to help deal with those challenges. I will work to ensure real fiscal responsibility, where the taxpayers get what they are paying for, so that Maricopa has what it needs to manage its growth. The increases to funding for public education. The continuance of Prop. 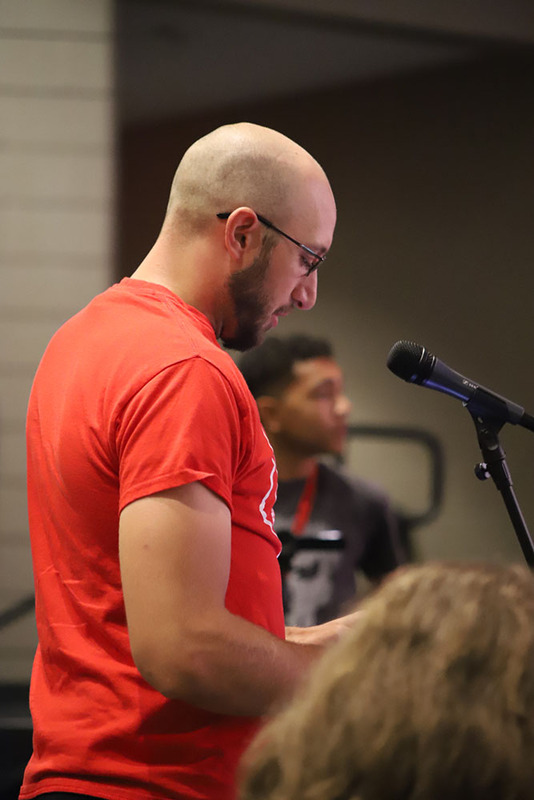 301 ensured our schools weren’t facing another cliff of lost funding in 2021, and the nine percent raise for teachers helped to begin to more appropriately compensate the most critical in-school factor for student achievement. The inability of the Governor and Legislature to make any progress on dealing with our water crisis. Arizona is now in its 21st year of drought conditions, our mountain watersheds had the driest winter on record, flows in the Colorado River are well below normal this year, and Lake Mead is now reportedly less than two years away from hitting the 1,075 foot level which will drive significant cuts to the water supply for Pinal County agriculture and the state water bank. 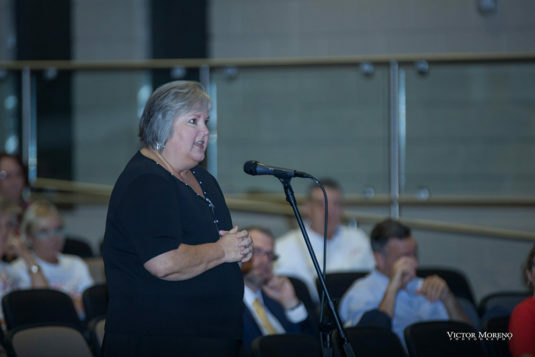 Instead of actually working the solution, by refusing to develop an in-state plan with all stakeholders and not being fully engaged with the Western States Water Council, we risk not being at the table when decisions are made. Our state must speak with one voice and collaborate as a good partner with our neighbors to ensure we will have water when we need it. Teachers have a much better understanding of why our schools are still underfunded. They also know which legislators care about public education and which ones don’t, and they intend to hold those who don’t, accountable. If government is to do the work it needs to do, it must operate in an ethical manner with full transparency and accountability. That’s why I intend for my first piece of legislation to be about ethics reform. I served 26 years in the Air Force, retiring as a Colonel. I commanded twice, taught war planning and while serving at NATO, and negotiated the deployment of nuclear planning assets between Turkey and Greece. 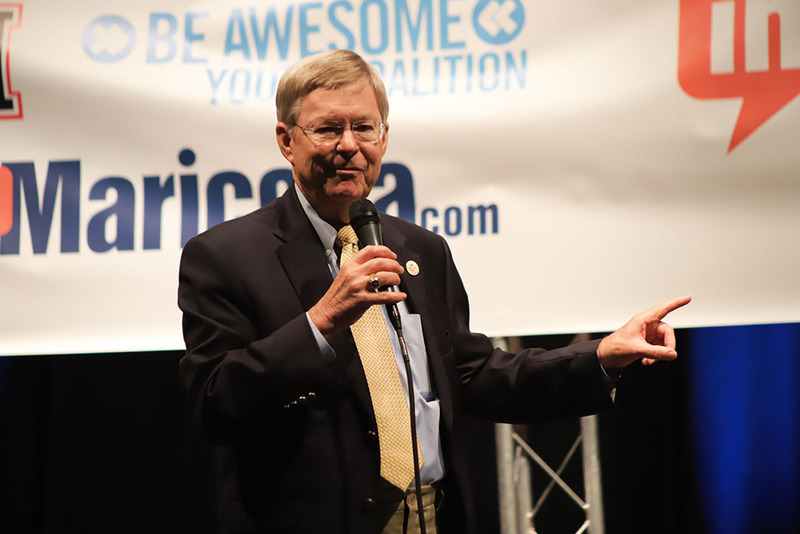 While assigned to the Pentagon, I also negotiated a worldwide deal with Microsoft, which saved the Air Force $200 million and was lauded by the U.S. Senate as a model for our federal government. I am a proven leader who knows how to reach across the aisle to get things done. 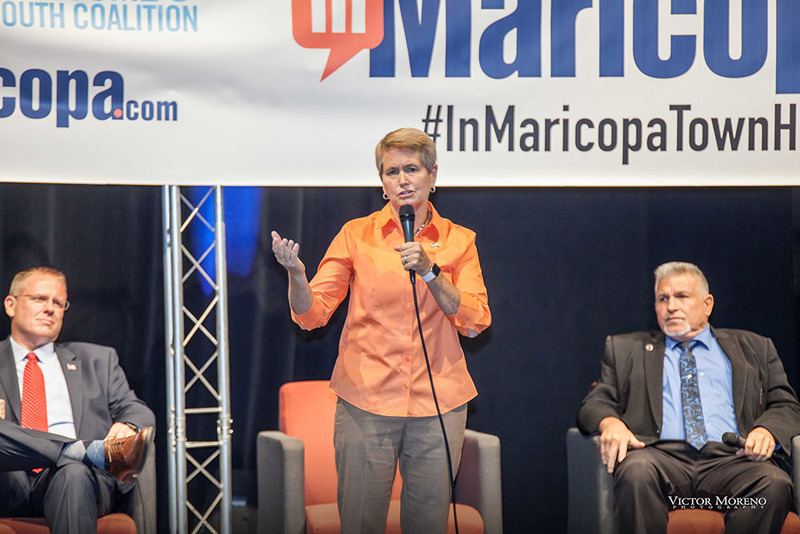 I also understand the meaning of service and want to continue to serve, for the people of Maricopa and LD 11. I’m glad you asked this question, because this is important to me. 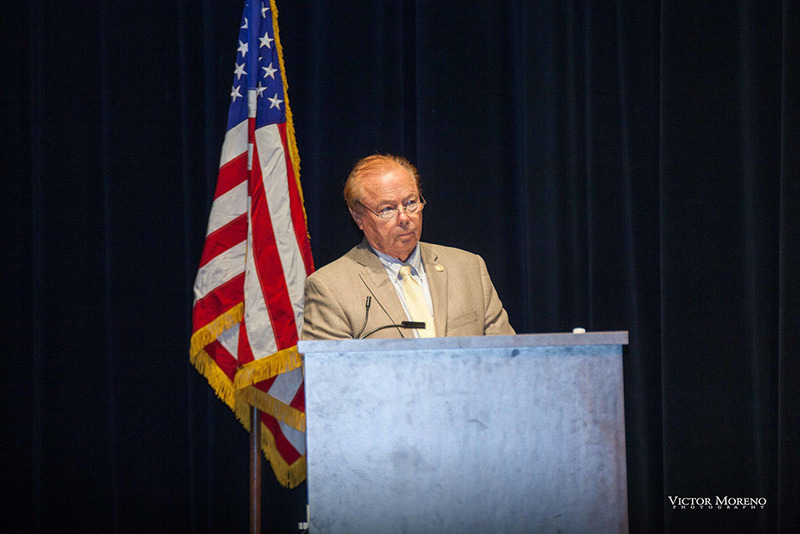 If elected, I will never forget that I work for my constituents. 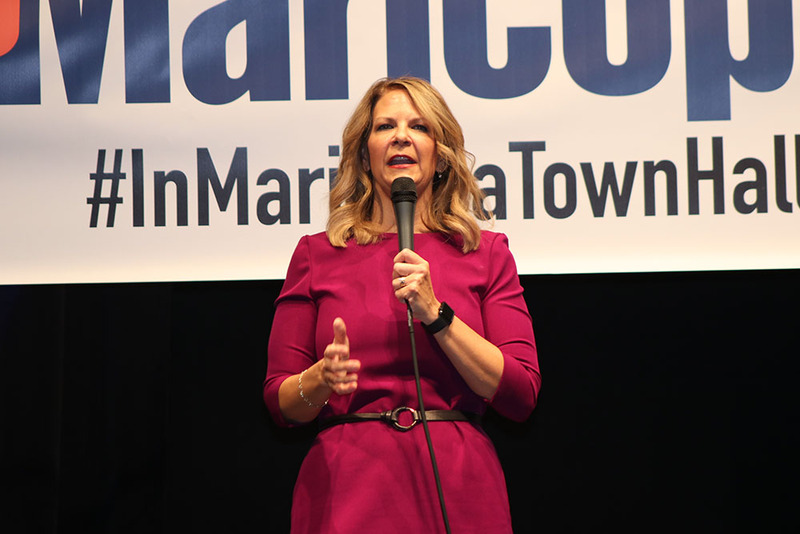 I intend to make myself available and responsive to my constituents in a variety of ways such as meetings on a rotating basis each Friday in LD 11’s various communities, regular email campaigns to keep constituents informed. I will also have an open door policy that encourages constituents to visit me at the Capitol. My name is Barry McCain. I am a born, raised and drafted out of Chandler High School. After a Navel Career I returned to my Arizona roots. Now, I am a Clean Elections Candidate for The Arizona House of Representatives in LD11; a Registered Lobbyist for Arizona Veterans With Disabilities and made sure the 347 was funded’ with the Mayor, at the State level because it is important to Maricopa. I also participate in Water and Transportation issue for the state. Occupation/previous occupations: Optician, Bank Teller, Substitute Teacher, SEI Teacher Coach, ELL Coordinator, Teacher. Family: Married for 14 years, two adult children, a ten year old and legal guardian for special needs sibling. Other community service: Religious Education teacher for 4 years. 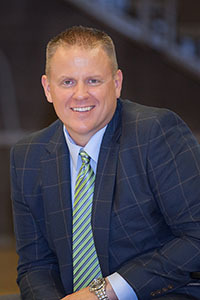 Volleyball Coach, Track Coach, and Club Sponsor. FOR volunteer. Maricopa Food Pantry Volunteer. 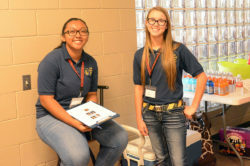 Volunteer at Our Lady of Grace. As a resident, I’m more than aware of the problems we face with the 347 and not having a 24-hour emergency room. I will support legislation that allows for 347 expansion, as well as legislation that creates opportunities for more medical businesses to come into Pinal County. I’m a huge fan of Sen. Kate Brophy McGee, who sponsored senate bill SB 1390 renewing Prop. 301, a six-tenths of a percent sales tax for public schools. 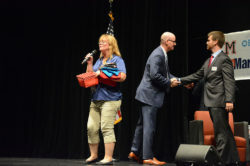 My biggest disappointment was that the 20 by 2020 Teacher pay increase is not a permanent solution and was short sighted in how it defined a teacher, with no impact to everyone that works in public education, like district employees, front office staff, para professionals, therapists, coaches, or bus drivers. 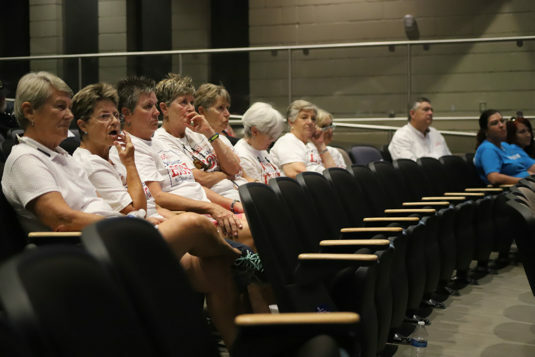 I think voters, not just teachers are ready to embrace legislators that are not working for special interest groups. Teachers have been open minded all along but are also now paying attention with eyes wide open. I would like to make sure departments other than the governor’s office are well paid as well as fully staffed, particularly in the area of corporate auditors. I don’t see any of the candidates as rivals. I think we’re all very qualified. We’re all good people. 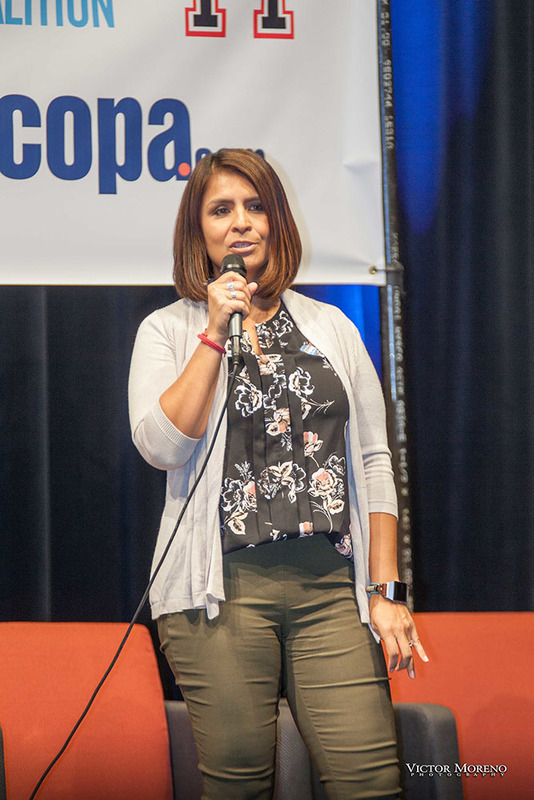 I will stay in contact as much as possible with the different LD11 Clubs and use google forms when I can to get feedback, but mostly, I would talk to the people. Engaged citizens quizzed nearly 40 candidates vying for federal, state and local offices Saturday in an InMaricopa.com Town Hall. 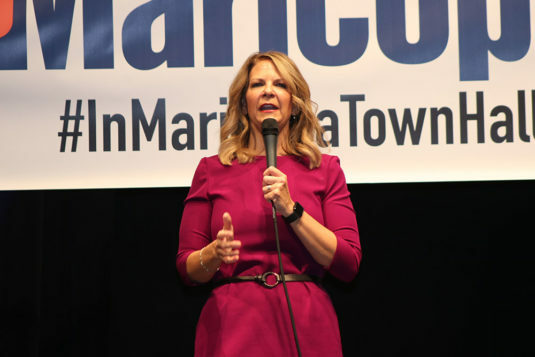 Among them were three candidates who want to work in Washington, D.C. 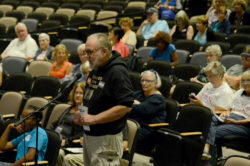 Voters fired off questions in person, too, spanning hot-button issues like education, immigration, State Route 347 and healthcare. 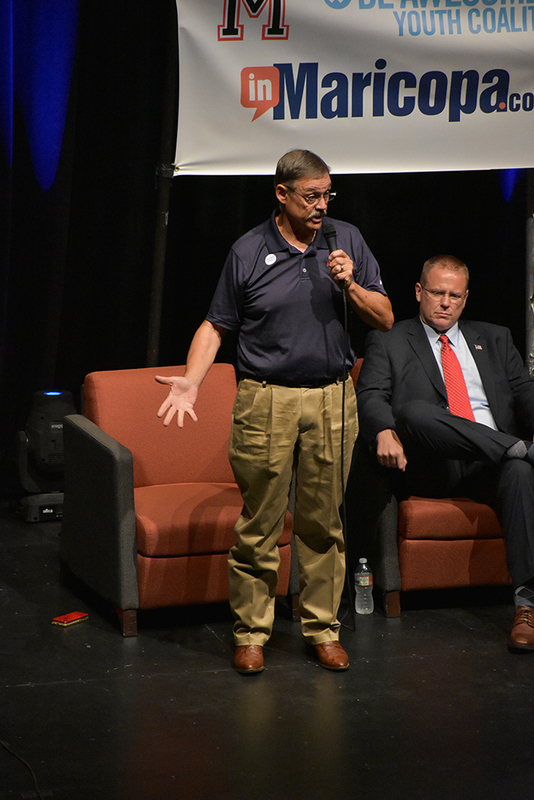 Improving and creating opportunities for rural infrastructure projects was on the mind of a local politician not campaigning during the debate Aug. 4. 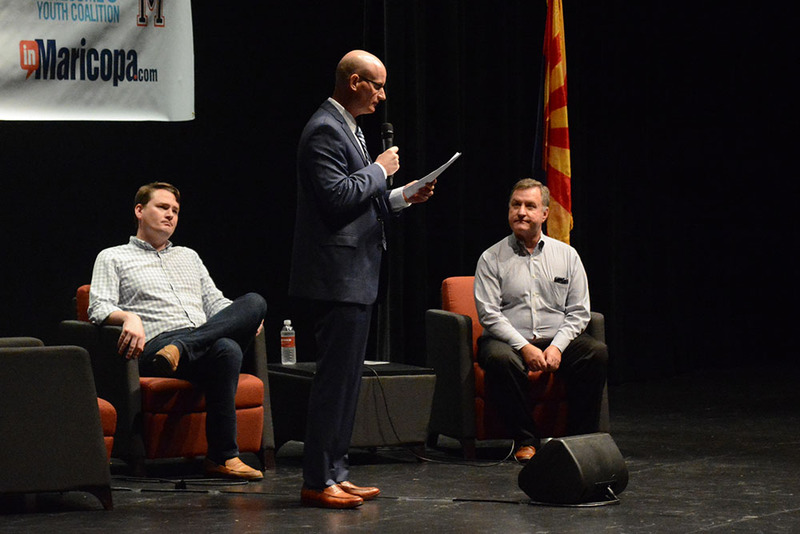 Pinal County Supervisor Anthony Smith asked candidates in the U.S. House of Representatives race what projects in Legislative District 11 they’d advocate for if elected to serve in Washington. 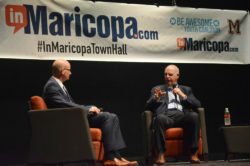 Steve Smith (R), current state senator and Maricopa resident who is campaigning to be a congressman, said State Route 347 and the proposed Interstate 11 are his priority projects. “When President (Donald) Trump says, ‘I want to pledge $1 trillion of revenue growth to infrastructure,’ I’ve got a list of what we need done,” Steve Smith said. 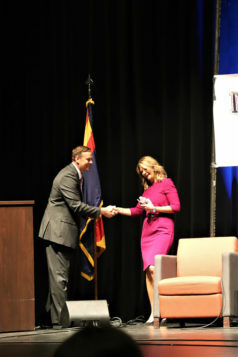 Supplying electricity to the Navajo Nation, widening Interstate 10 and constructing off ramps through the Gila River Indian Reservation to improve opportunities for economic development were projects near to the heart of fellow Republican candidate Tiffany Shedd. 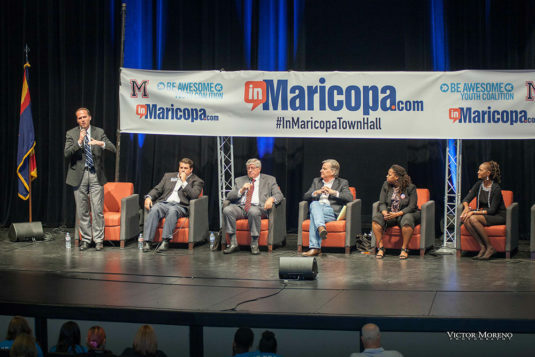 Maricopa’s overpass was funded partially from a $15 million federal TIGER grant, as well as $15 million in local contributions, and another $19 million from the Arizona Department of Transportation. 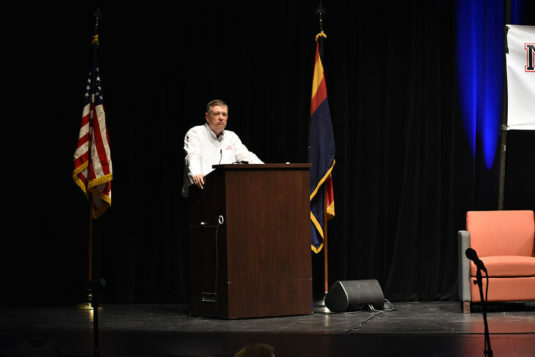 “We really need to repeal these draconian laws that drive the cost of a project up once federal money touches it, so that our rural communities can have enough to grab on to some of that infrastructure money and it doesn’t just go to cities like Phoenix, New York City, Los Angeles,” Shedd said. Wendy Rogers, the third Republican in the U.S. Congress LD11 race, did not attend the debate though scheduled to appear. Two Democrats and three Republicans are hoping for a job in the U.S. Senate, including Kyrsten Sinema (D), Deedra Abboud (D), Martha McSally (R), Kelli Ward (R) and former Maricopa County Sheriff Joe Arpaio (R). 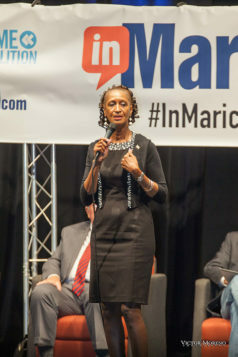 Ward, a former state senator, and the only participant in her race at the debate, faced-off with critics during a confrontational solo campaign appearance. 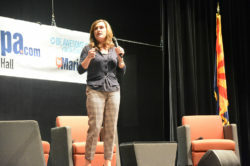 After discussing civility in politics and healthcare, Ward, in her statements about border security fired off against hecklers in the audience. Maricopa resident Reid Martin answered back, proclaiming his political beliefs align with the Republican party as a moderate. From the back of the room, Martin said he was frustrated with Ward’s decorum. Martin said he’s been a registered Republican in every election but said this is the first election where that might change. He said he came to the Town Hall to question candidates face-to-face. “If you read enough and you follow these guys enough, our representatives are now running for federal level, you know where they’re going, you know what they voted for, but it’s different to actually hear it come out of their mouths and go on the record,” Martin said. 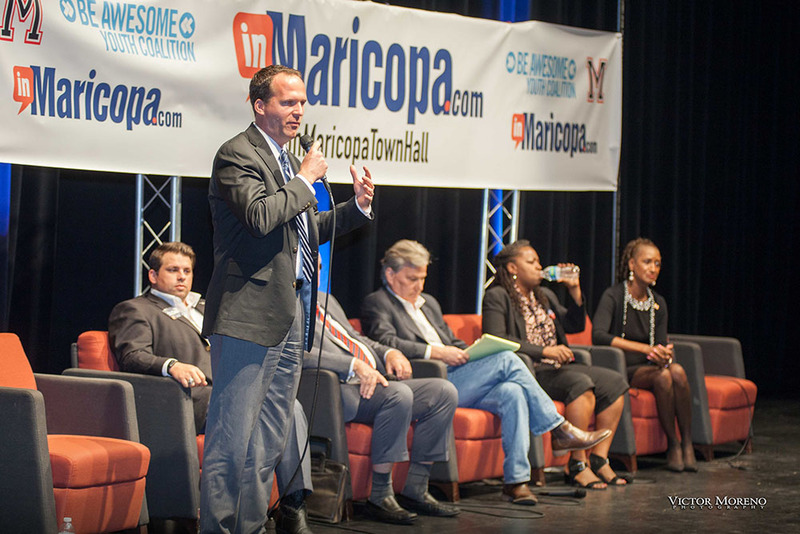 Nearly 40 candidates are lined up to participate in a Primary Election town hall Saturday in Maricopa. InMaricopa.com Town Hall features federal, state and local races in three time-blocks at the Maricopa High School Performing Arts Center. The candidates will take questions directly from the audience. 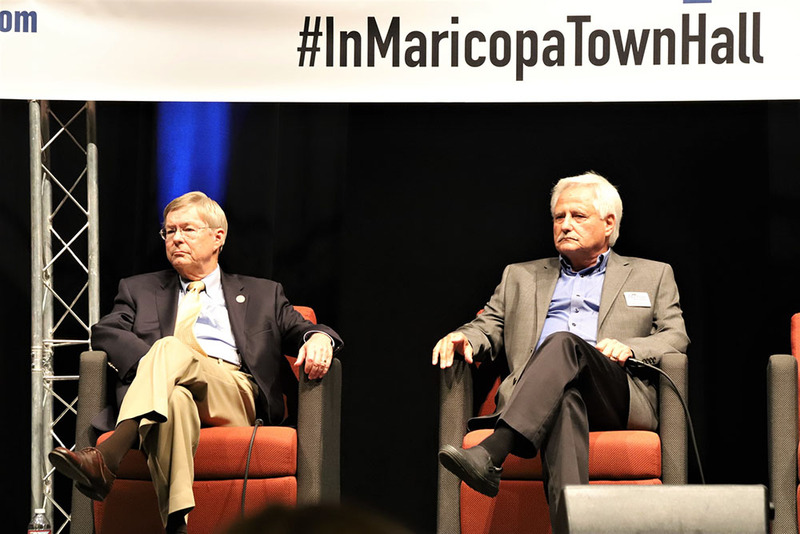 The event will be shown on Facebook Live starting at 10 a.m. on Facebook.com/InMaricopa, where viewers can also ask questions that may be relayed to the candidates as time permits. 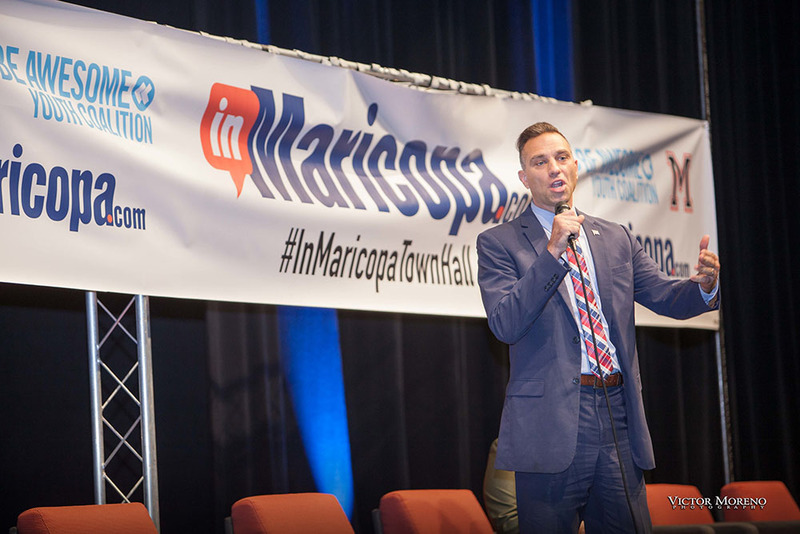 Viewers can also follow on Twitter and Instragram @InMaricopa. 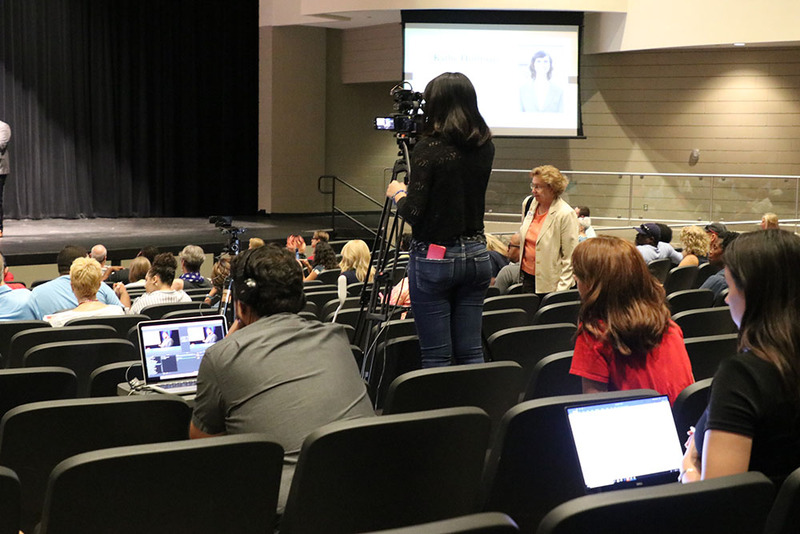 The Town Hall begins at 10 a.m. All are invited to watch, listen and participate. Facilitators include Mayor Christian Price, state Sen. Frank Pratt, Judge Lyle Riggs, educator Rick Abel and government relations specialist Janeen Rohovit of SRP. 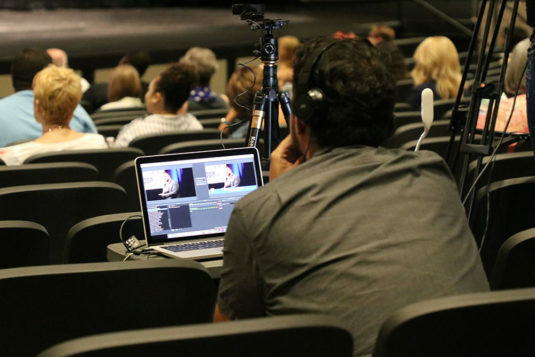 Those in attendance who wish to question candidates will be asked to line up at a stationary microphone. The facilitators will hold candidates and audience members to the same rules: 1. Be polite. 2. Stay on topic. 3. Be concise (don’t repeat yourself). 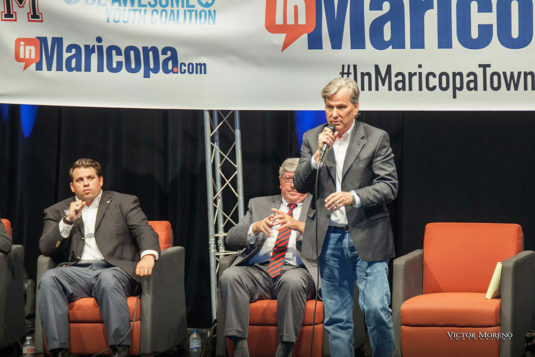 Because this is a primary debate, candidates are encouraged to engage conversationally with primary opponents on the issues but not with candidates from other parties who may also be on stage. 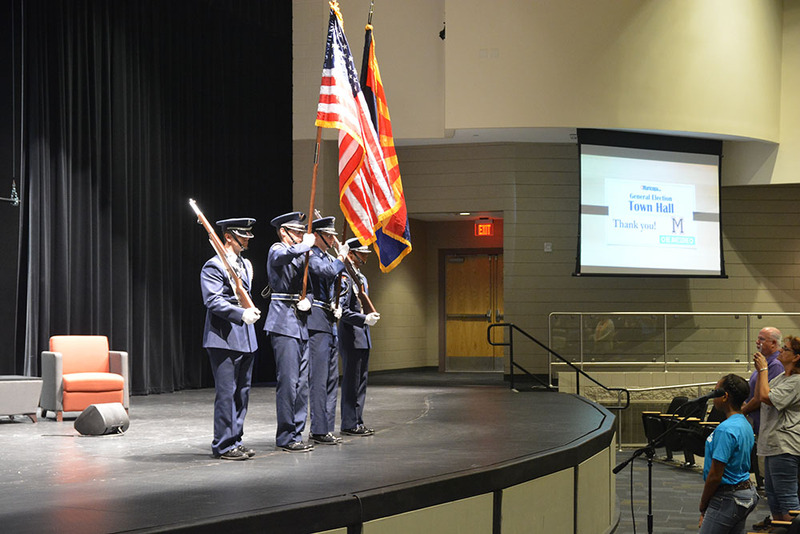 Students from high school organizations including Student Council, Air Force Junior ROTC, Junior State of America, National Honor Society and the MHS Marching Band will play important roles in running the event. 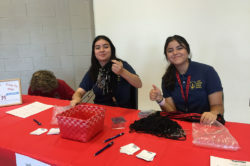 Also participating are members of the Be Awesome Youth Coalition, which will be selling water and hot dogs in the lobby. The lobby will also be the place to meet many of the candidates as several have prepared campaign tables to share their message. 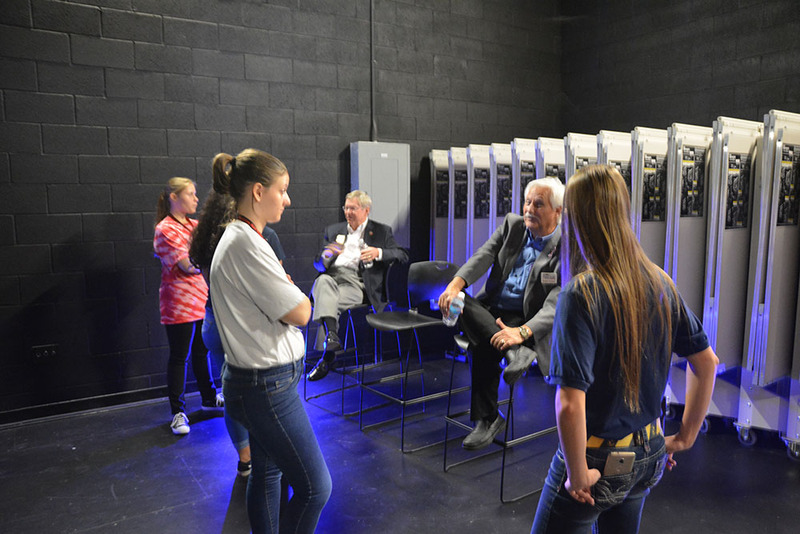 Block 1 involves candidates running for Congress. All three Republicans on the ballot for U.S. House of Representatives – Wendy Rogers, Tiffany Shedd and Steve Smith – have indicated their participation. 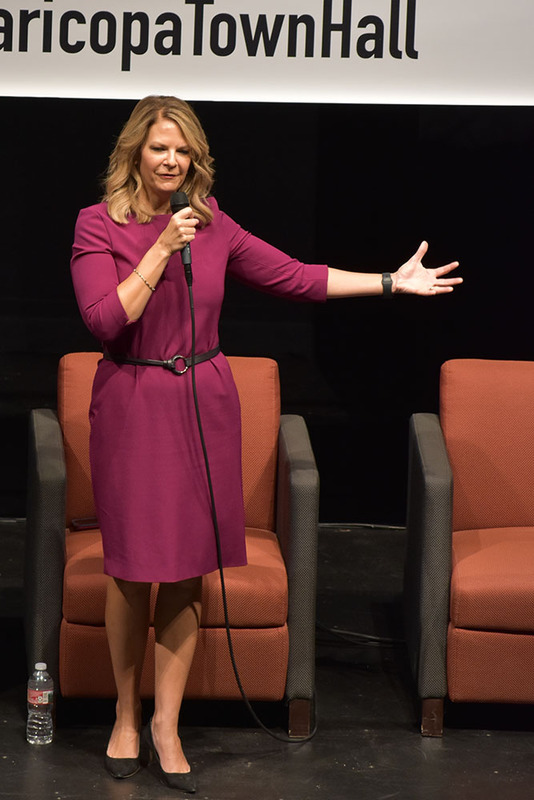 Kelli Ward, a Republican, is the only U.S. Senate candidate to sign up and will take questions on her own. 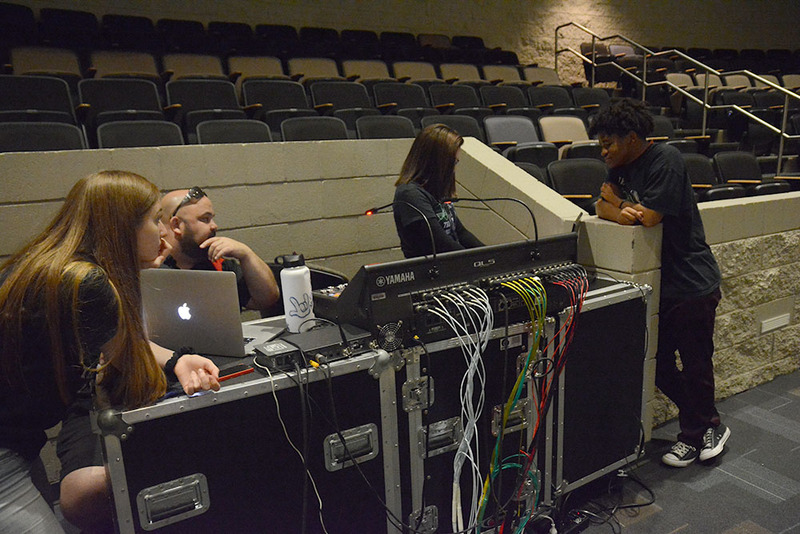 Block 2, scheduled to start no sooner than 11 a.m., features state races. 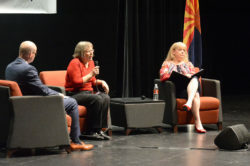 Six of eight candidates seeking two seats on the Arizona Corporation Commission are scheduled to appear – Democrats Sandra Kennedy, Bill Mundell and Kiana Sears, and Republicans Justin Olson (an incumbent), Jim O’Connor and Eric Sloan. 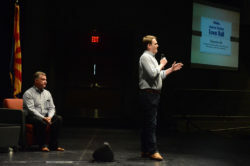 They will be followed by all six candidates running for state representative in Legislative District 11 – Democrats Hollace Lyon, Barry McCain and Marcela Quiroz, and Republicans Mark Finchem (an incumbent), Howell Jones and Bret Roberts. 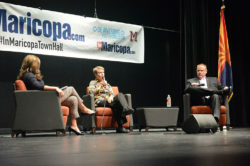 Three of the candidates are Maricopa residents. Though they have no primary competition, LD 11 Senate candidates Vince Leach, a Republican, and Ralph Atchue, a Democrat, will take audience questions. 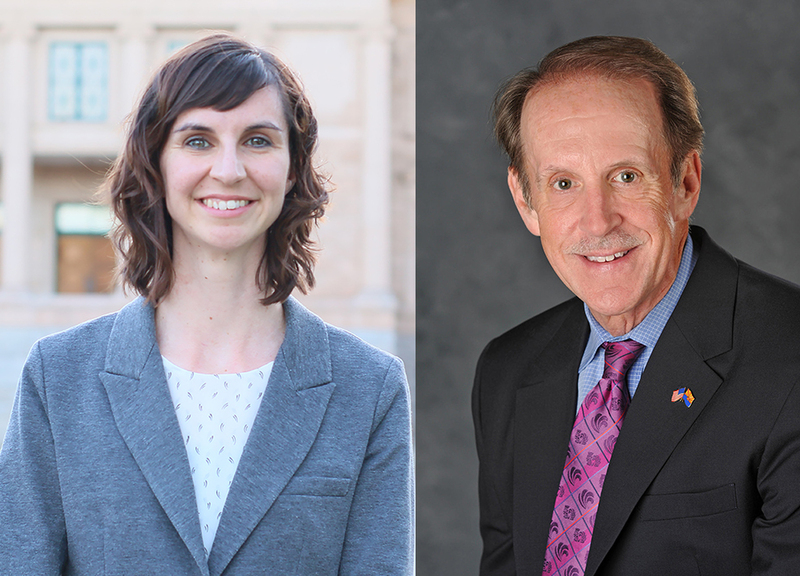 Two governor candidates have agreed to appear – Republican Ken Bennett and Democrat Kelly Fryer. 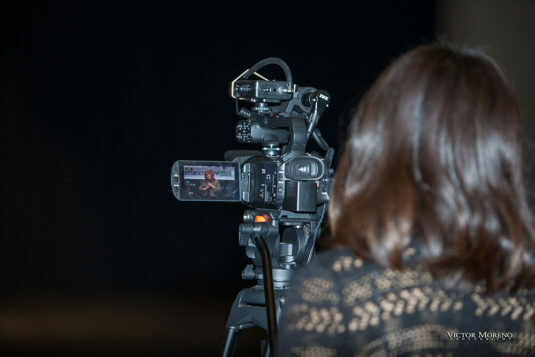 They will be followed by state treasurer candidate Jo Ann Sabbagh. Five of seven candidates for state superintendent of public instruction are scheduled next. They are Republicans Bob Branch, Jonathan Gelbart and Frank Riggs, and Democrats Kathy Hoffman and David Shapira. 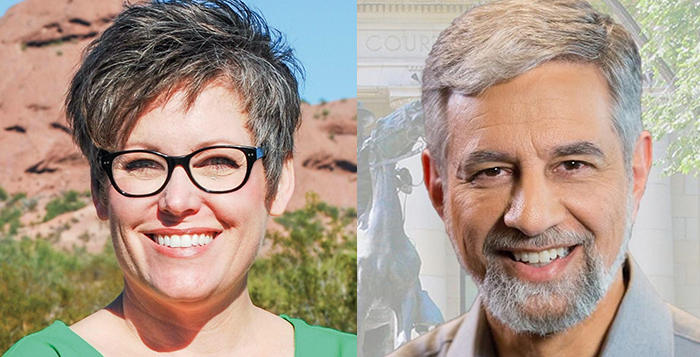 Block 3 includes county and city races and is expected to start after 2 p.m.
Republicans Scott McKee and Amanda Stanford (an incumbent) are the only candidates vying for the position of clerk of Pinal County Superior Court. 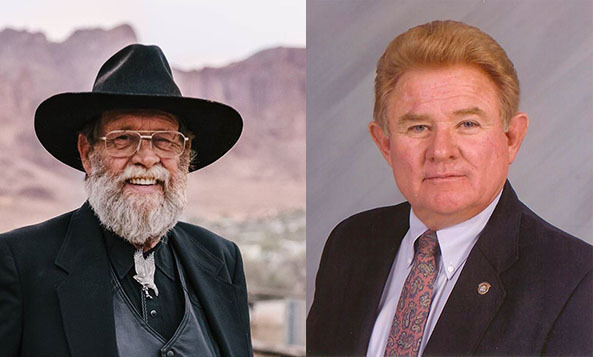 All three candidates for constable of the Maricopa/Stanfield Justice Court are expected to participate – Republicans Bill Griffin and Glenn Morrison and Democrat Andre LaFond. 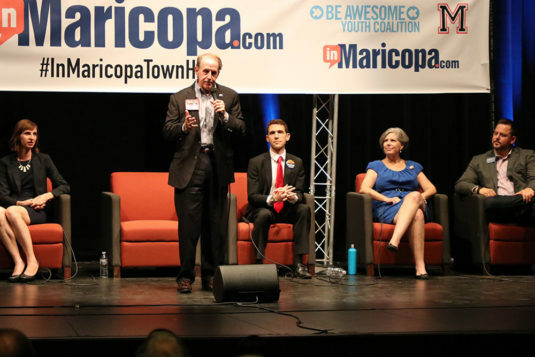 To wind up the day of politics, seven city council candidates will take the stage – Linette Caroselli, Vincent Manfredi (an incumbent who is minority owner of InMaricopa), Bob Marsh, Cynthia Morgan, Paige Richie, Rich Vitiello and Henry Wade (an incumbent). 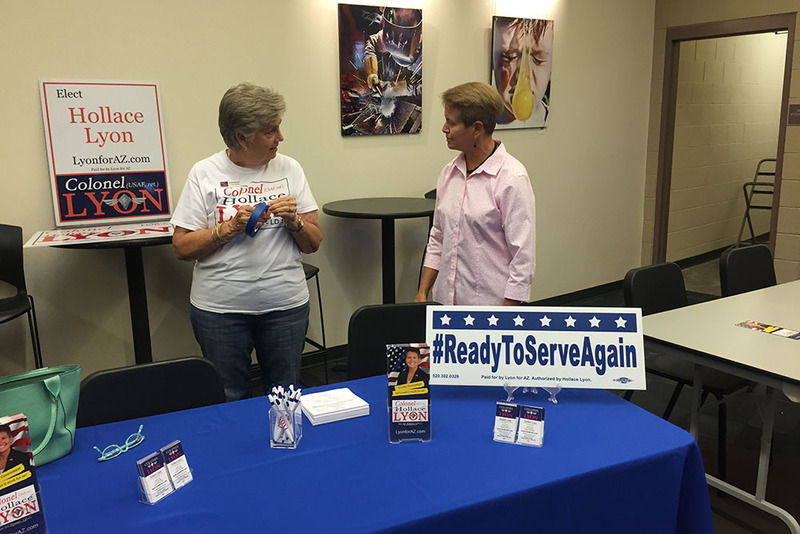 They are running for three seats in a nonpartisan election. The schedule is tentative. 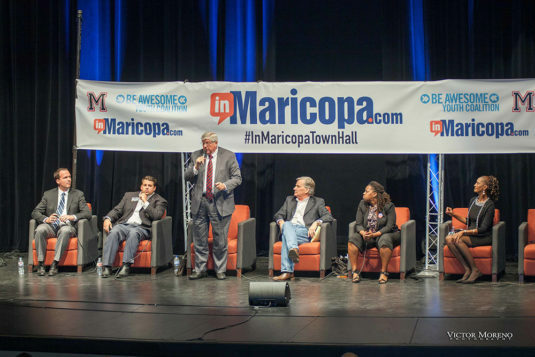 Learn about the Town Hall at MaricopaEvents.com. 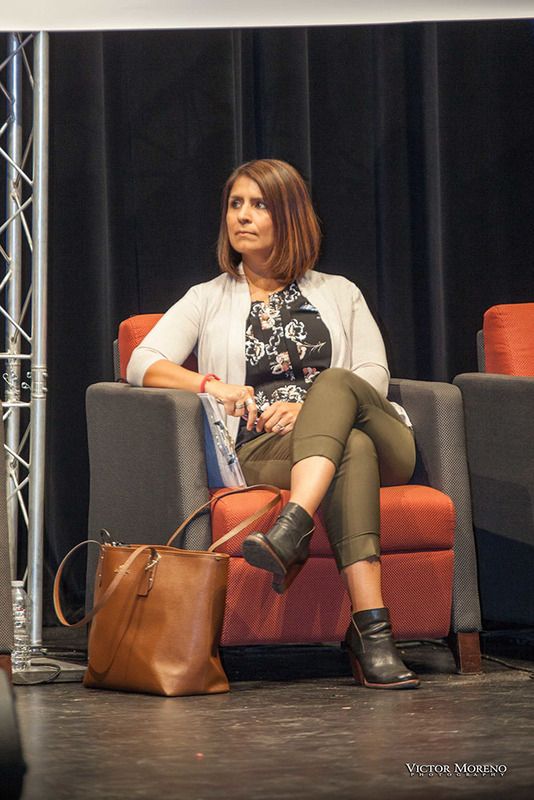 I am much honored to have been asked to pen this letter for Linette Caroselli, a woman who has dedicated her life to working with people within her community. It has been my pleasure to know Linette for 20 years and she has always been that person who wanted to make things better not only for herself and her family but for everyone. 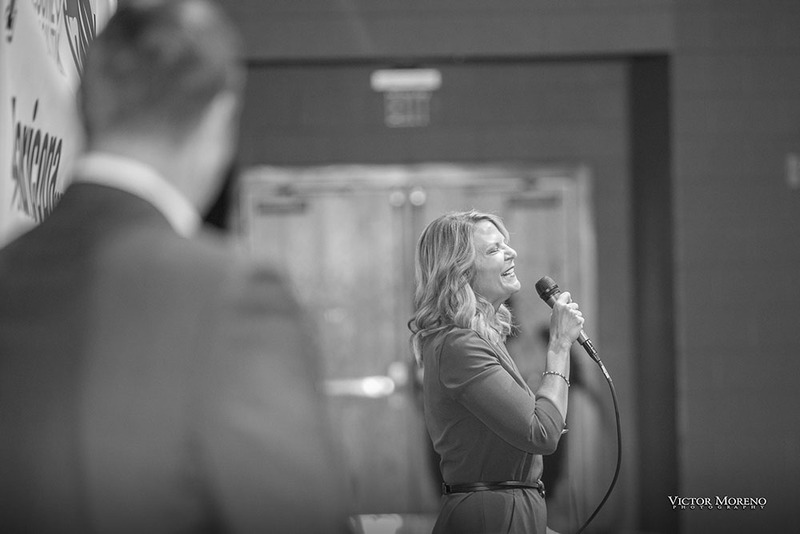 She is a very committed team player but not afraid to step out and lead. 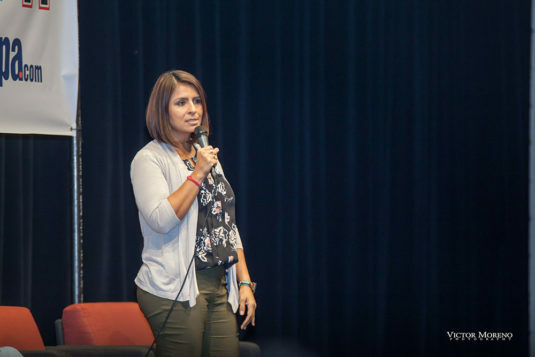 As a school teacher in Paterson, New Jersey, Linette’s students always soared because of her preparedness and willingness to go above and beyond for her students. Her students always knew that she was there for them. 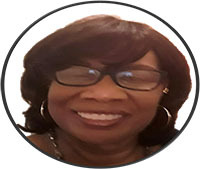 As a member of Sigma Gamma Rho Sorority, Inc. Linette served the Northeastern Region as the undergraduate chapter coordinator making her responsible for all of the undergraduate members from Maine to North Carolina. This position required frequent traveling with the writing and enforcement of policy. 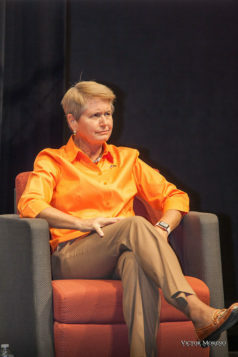 She served in this position with distinction. 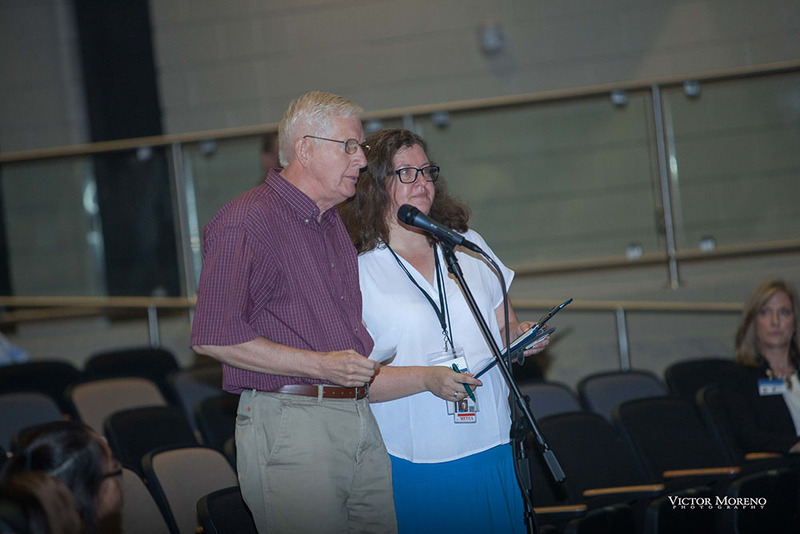 As a 12-year member of the Irvington Municipal Council from 2002-2014, Ms Caroselli worked with me on many community initiatives such as the Irvington Scholar Program and Community Development Zones. As a member of a Municipal Council you are responsible for legislating, investigating and appropriating. 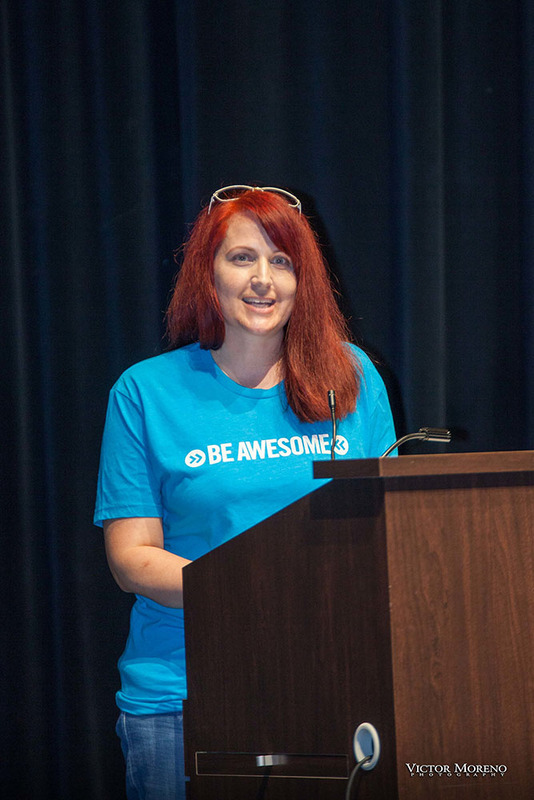 Linette Caroselli is capable of these duties. 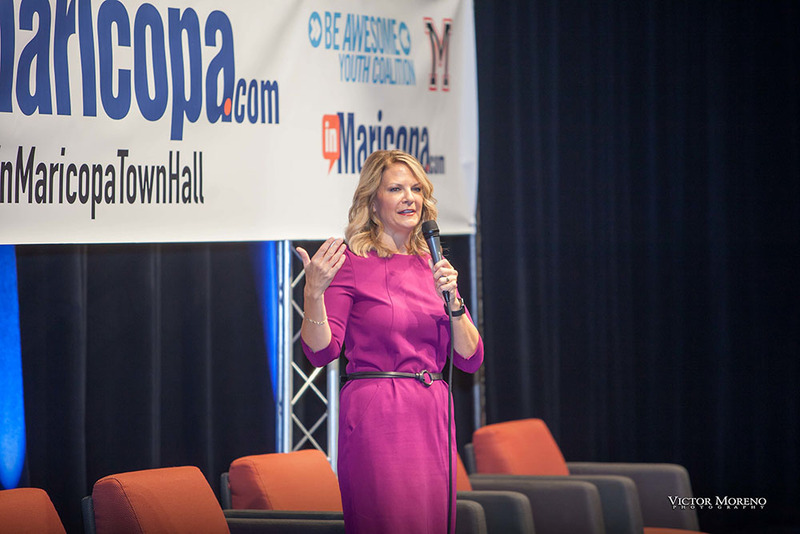 She has the 4 E’s: she is Eloquent, Efficient, Experienced and Effective. A vote for Caroseill is a vote for good government, effective leadership and quality of life improvement. 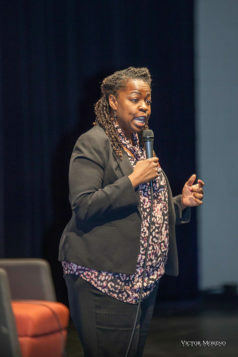 Andrea C. McElroy is a former member of the Irvington, New Jersey, Municipal Council. When I first ran for City Council in 2010, I was up against two incumbents and five newcomers. I (along with two other candidates) received the endorsement from COMPA (City of Maricopa Police Association) and I truly credit them for my win. Without their endorsement and their boots on the ground going door-to-door distributing information, I don’t think I would have won. 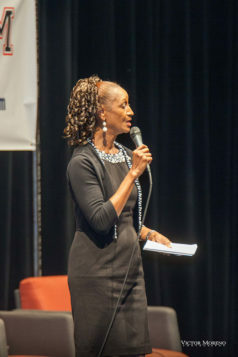 I had unseated an incumbent, and two years later in 2012 a newcomer by the name of Christian Price ran against an incumbent councilmember for the vacated mayor seat. I was the only seated councilmember to endorse him and go door-to-door campaigning to “Elect Mayor Price.” The mayor was sworn in along with two newcomers, Leon Potter and Bridger Kimball. I had appointed all of these newly elected to a committee prior to them being elected (Potter to Parks, Recreation and Libraries, Kimball to Planning & Zoning and Price to Board of Adjustments). That same year, Peggy Chapados was appointed (I was the vote that broke the 3-3 tie) to a vacated seat. 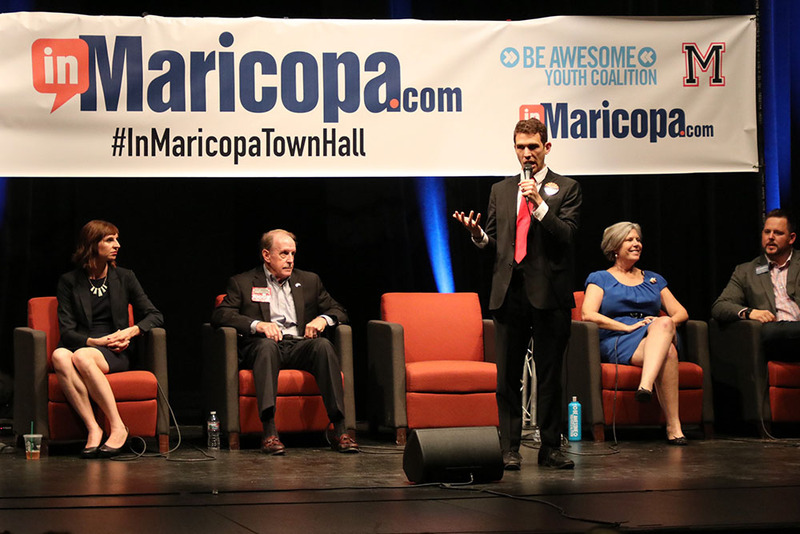 Four newcomers (the majority) with fresh ideas helped us launch a new City Hall and Copper Sky. 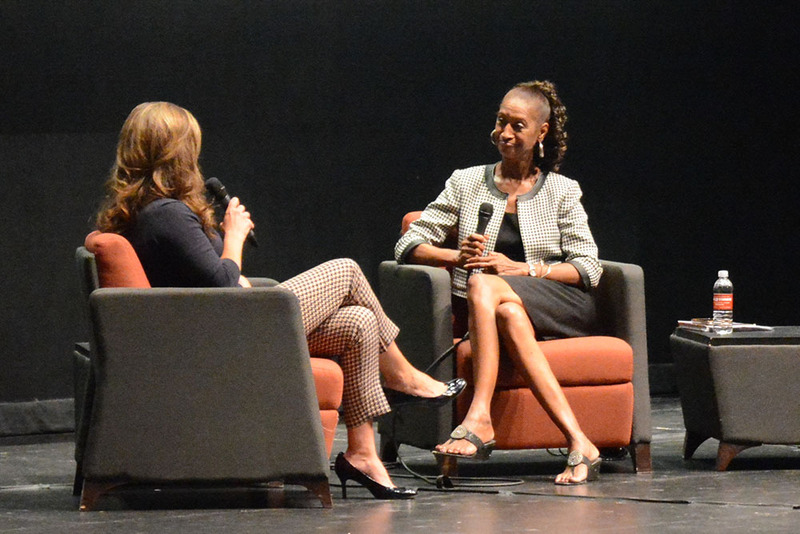 I chose to run for a different elected position in 2014, lost that election and had been out of office until 2016 when I ran once again for City Council. In 2016 I was advised by my campaign manager to seek the endorsement of Mayor Price and against my intuition, I did seek that endorsement and was declined. I went on to win that election with no endorsements and I also did not accept any campaign contributions/funds. 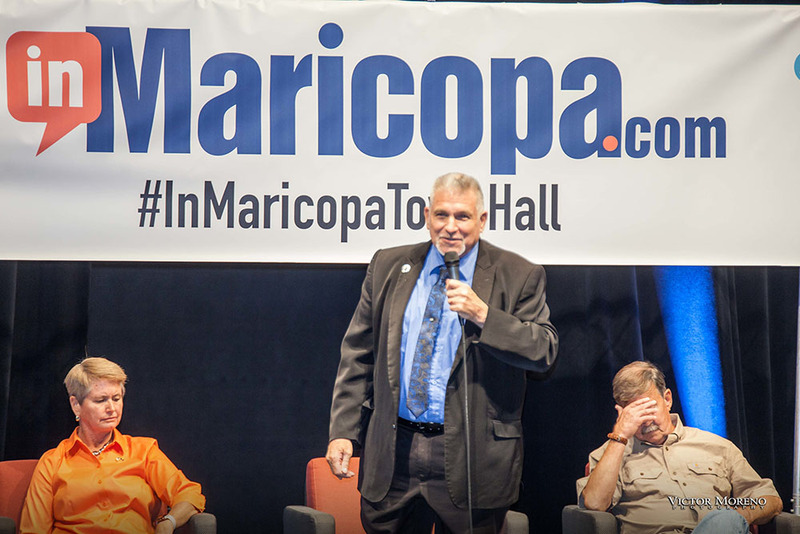 I didn’t want to be indebted to anyone and I won big with Maricopa’s endorsement – the most votes (6,826) of any elected councilmember in Maricopa’s history; more than Mayor Price, who ran unopposed, and over 2,000 votes more than the incumbent councilmember. I am a bit shocked and surprised by the Mayor’s endorsements, but in my case, his endorsement (or lack thereof) did not make any difference. I believe that in order to move the city forward we must elect newcomers with fresh ideas; there are five new comers in the City Council race. I ask those 6,826 voters that they consider casting their vote to elect Linette Caroselli. 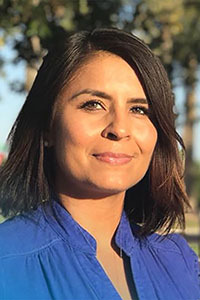 Not only because she has my endorsement but because she is an untainted newcomer that will lead our city in a transparent straight-forward manner. Please do your research, don’t be misled and vote for those that will have YOUR best interest in mind. Julia Gusse is a member of the Maricopa City Council. I have known Vincent Manfredi and Henry Wade for almost a decade and proudly served with both on city council since 2014. Councilmen Manfredi’s and Wade’s tireless work and dedication to the people of Maricopa is beyond measure. Potholes aren’t Republican or Democrat. 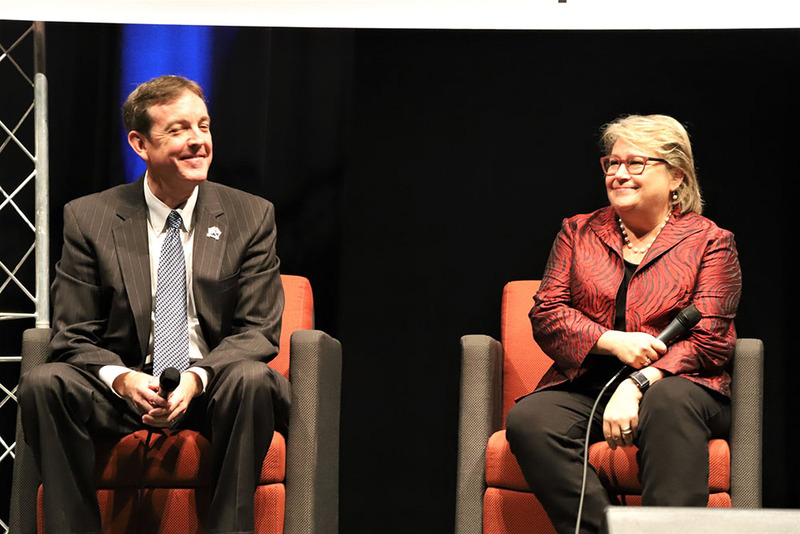 Councilmembers must be willing to work together to achieve the city’s goals, and Vince’s and Henry’s focus is always on the betterment of our community and all its citizens. Councilmembers Vincent Manfredi and Henry Wade are tremendous assets to our city council and community. I’m going to proudly vote for them on Aug. 28 and encourage the rest of Maricopa to do the same. 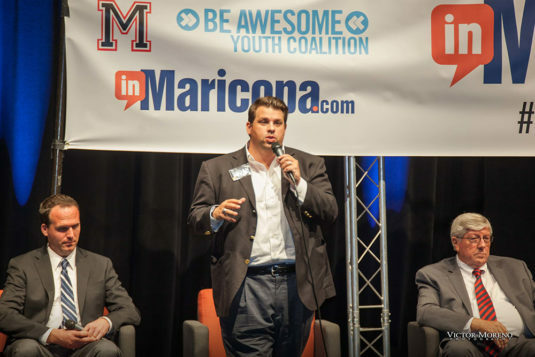 Christian Price is the mayor of Maricopa. 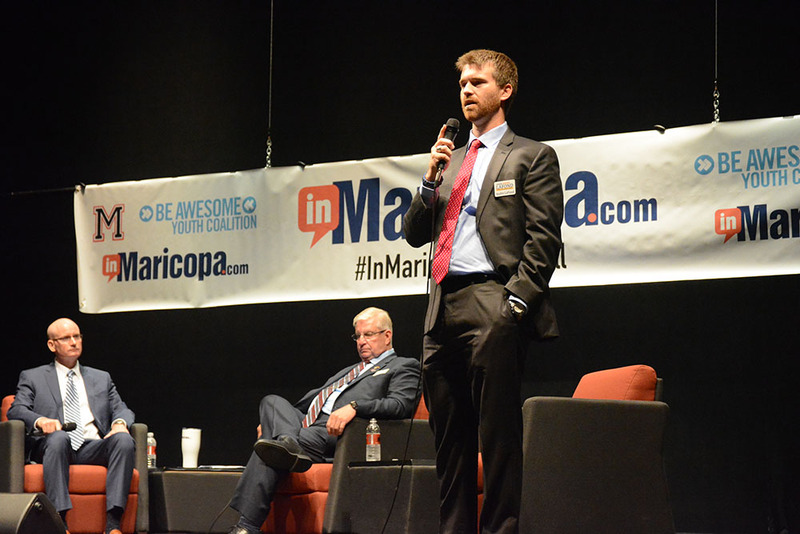 Note: Vincent Manfredi is minority owner of InMaricopa. 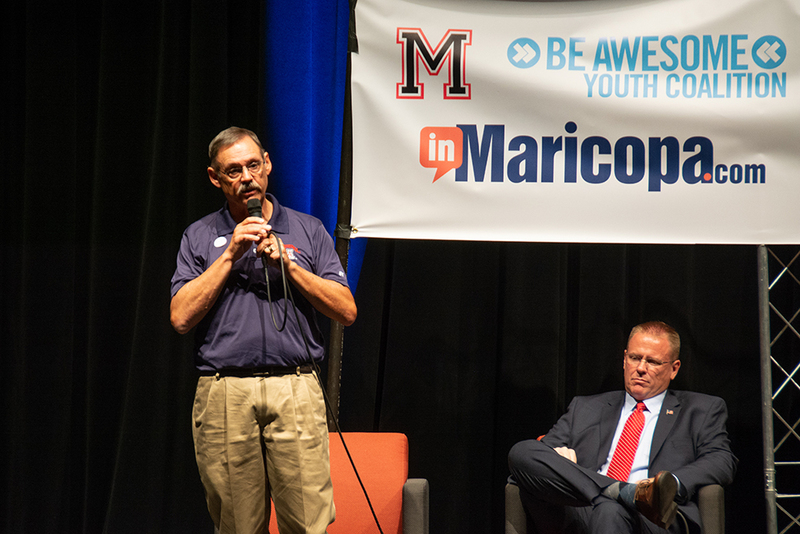 See future leaders at work: Maricopa High School students and Be Awesome Youth Coalition will be on the scene to help run the InMaricopa Town Hall on Saturday. Students will get a peek at the democratic process during a candidate debate in August. 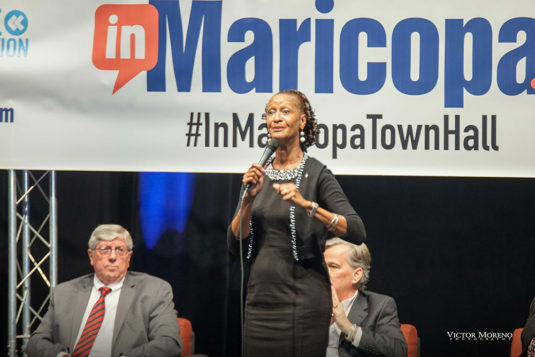 The Primary Election Town Hall, an InMaricopa.com event, will host candidates vying for local, state and federal positions. Teens from around Maricopa will volunteer there with various organizations, the leaders of which hope the students will learn real-world skills like representation, proper debate and public interaction. 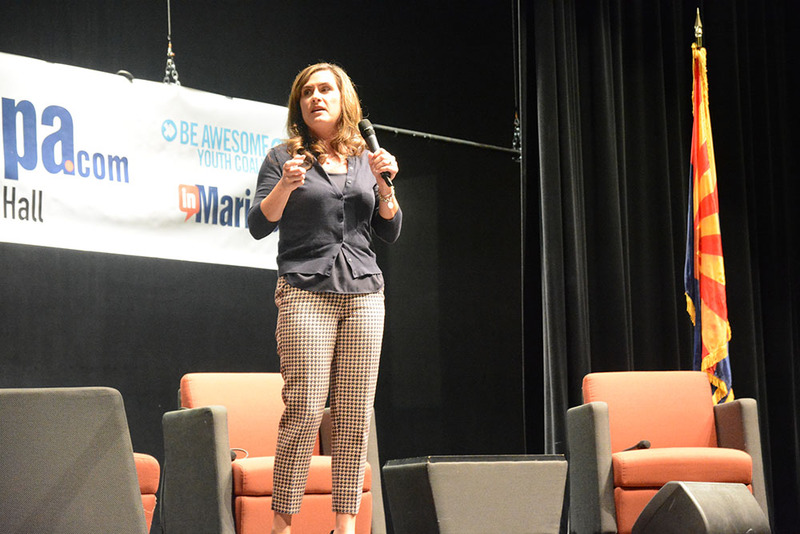 “The kids who will show up to an event like this will be engaged kids who are serious and polite who want to be involved and know their issues,” said Priscilla Behnke, program youth director for Be Awesome Youth Coalition. Up to eight teens will represent the group during the town hall, including students from Maricopa High School and Sequoia Pathway Academy. 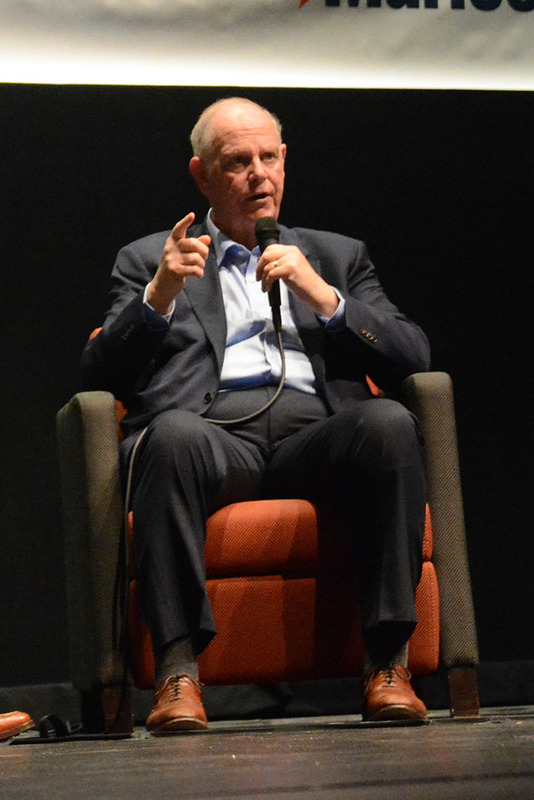 It’s Behnke’s view that those who learn to get involved with the community early earn personal benefits like confidence later in life. 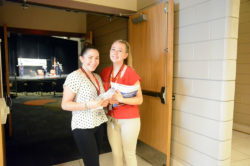 BAYC participants attend various events in Maricopa every year. 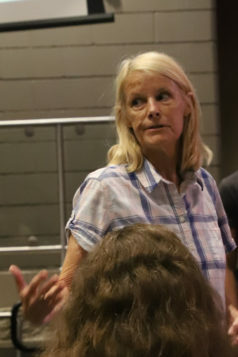 Behnke said she stresses to teens the importance of customer service, honesty and advocacy when her group makes public appearances. 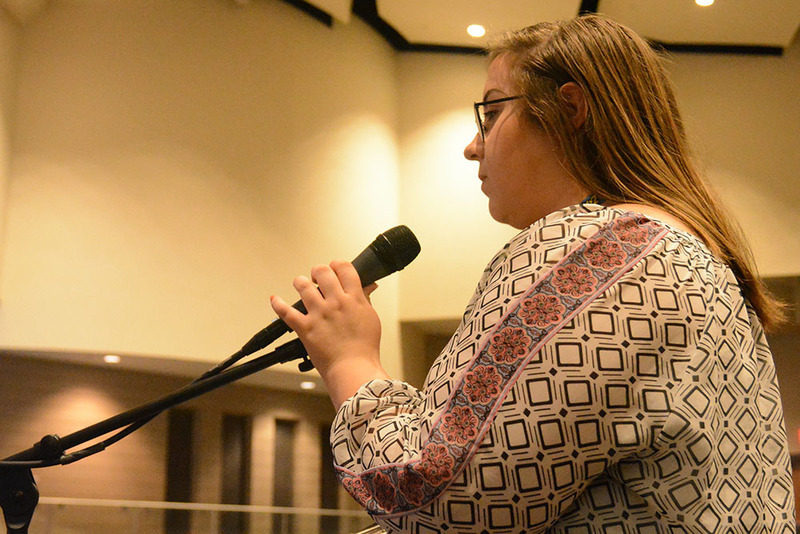 She hopes students will observe the way candidates present themselves and how knowledgeable their responses are. 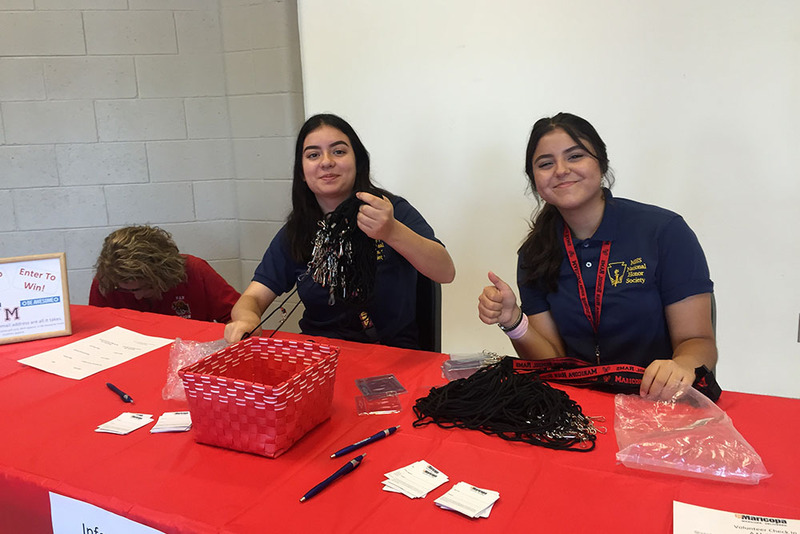 Other student groups and clubs at Maricopa High School are volunteering at the event in various capacities, from student ambassadors to greeters and photographers. 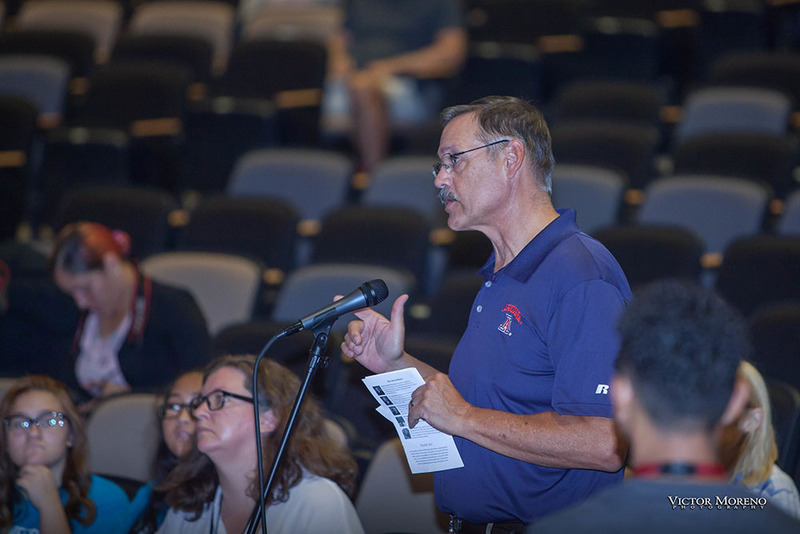 Student Council, Air Force Junior ROTC and other campus organizations of future leaders will be both up front and behind the scenes. 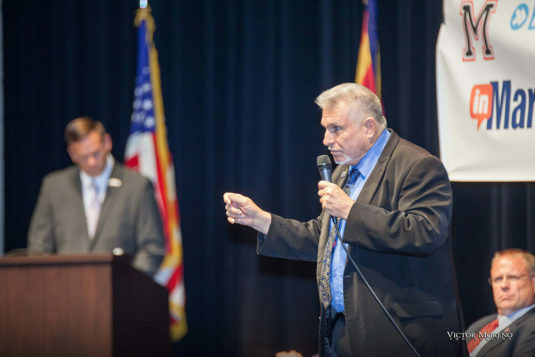 The debate begins 10 a.m. on Aug. 4 at Maricopa High School. Click here to learn more.